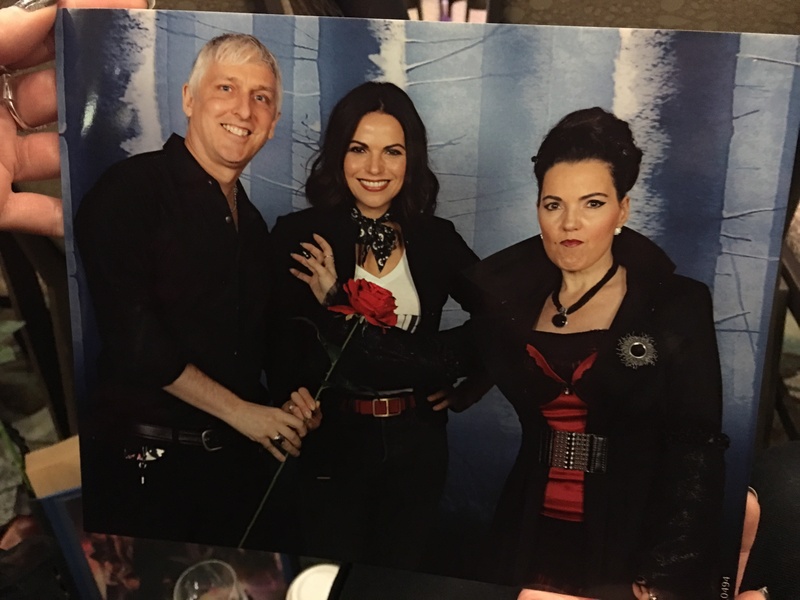 One of my favorite photos from the OUAT Vancouver convention is this picture with Rebecca Mader and Lana Parilla. 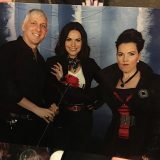 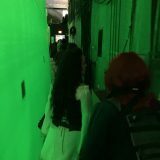 Having a picture with Zelena and Regina is priceless and magical! 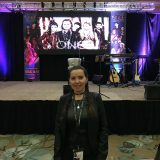 You probably all know the show that started in 2011 but we hadn’t heard of the ABC TV show “Once Upon A Time” until 2017 when we started watching it on Netflix. 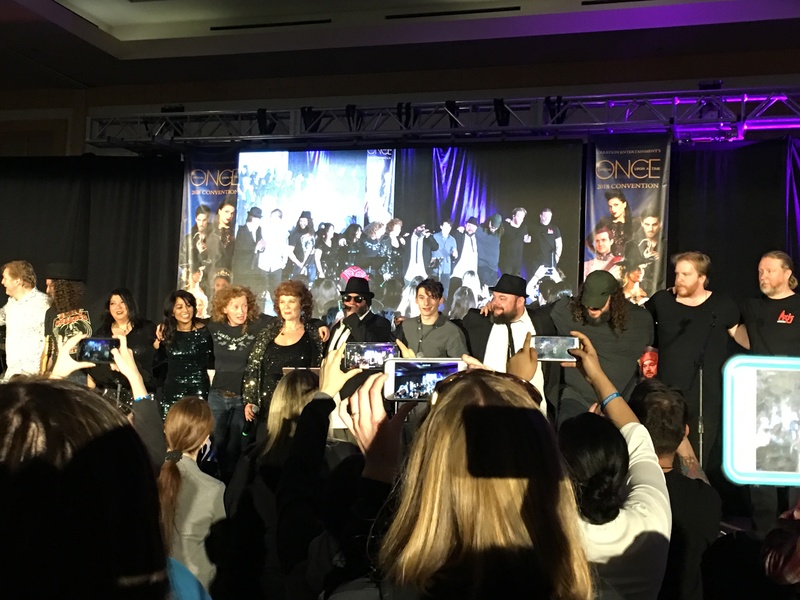 We were hooked from the beginning and started binge-watching 3 or 4 episodes every day once we started. 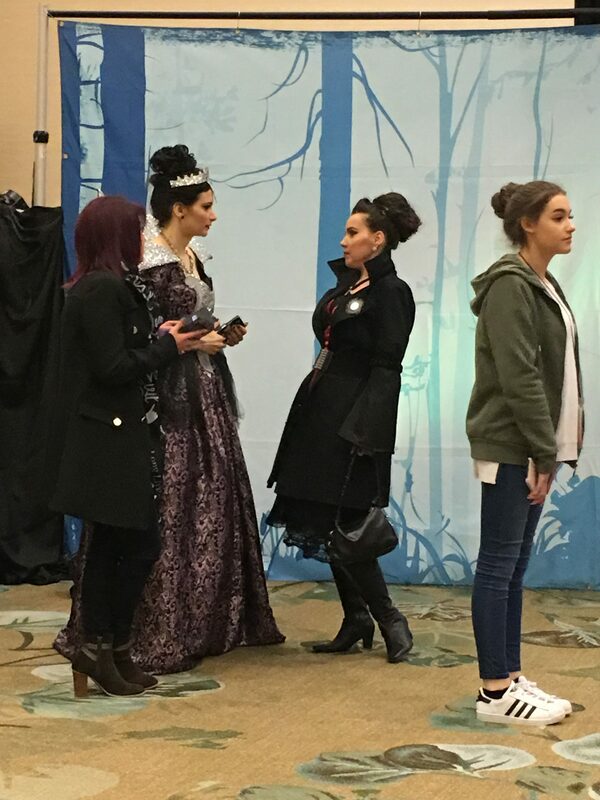 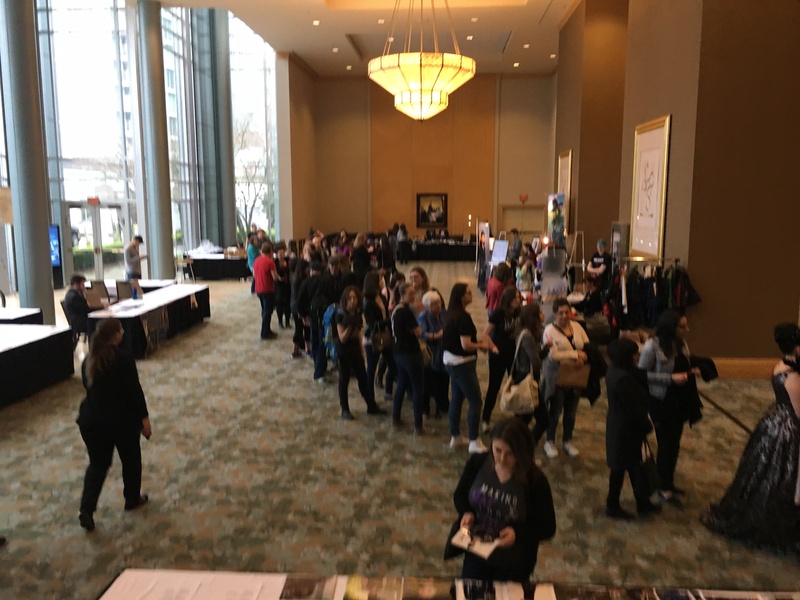 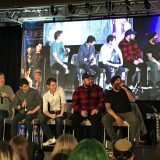 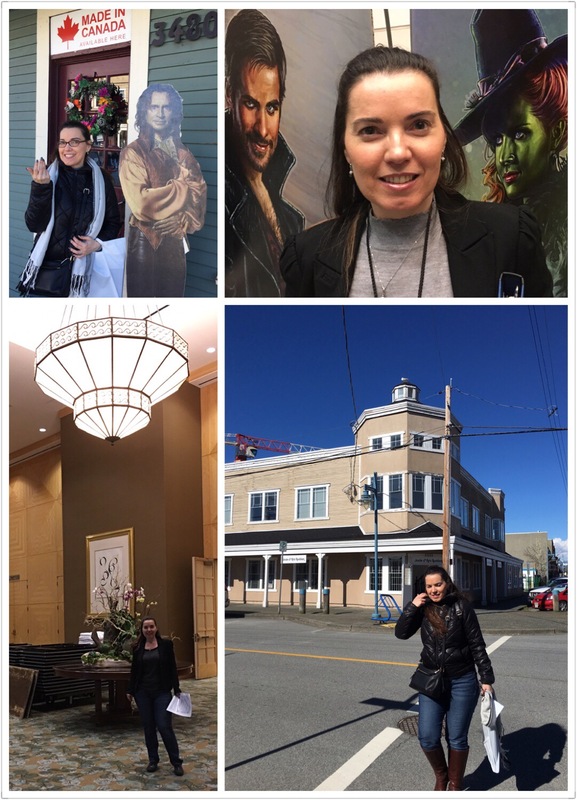 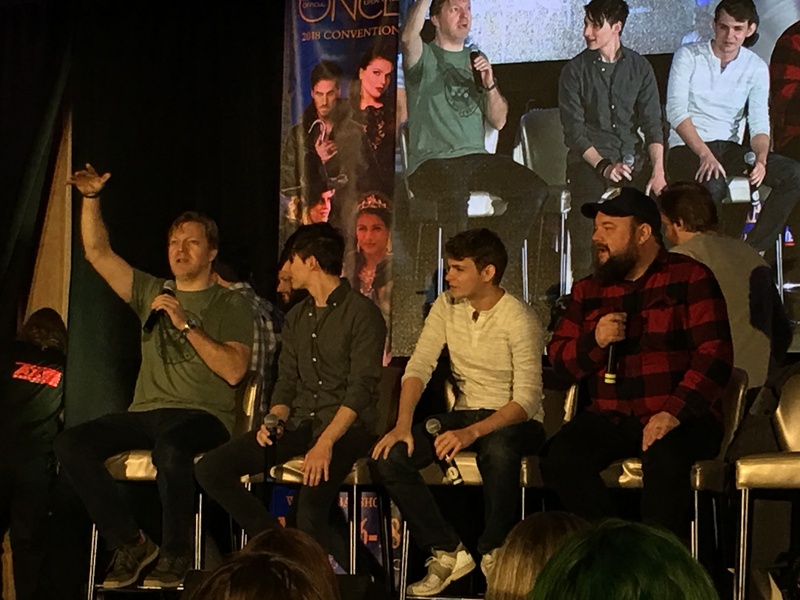 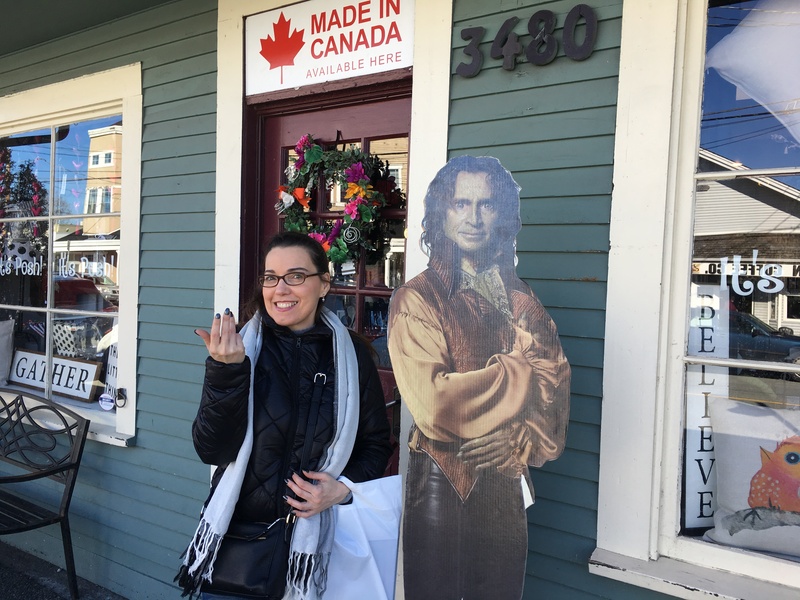 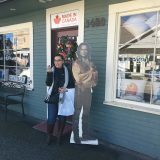 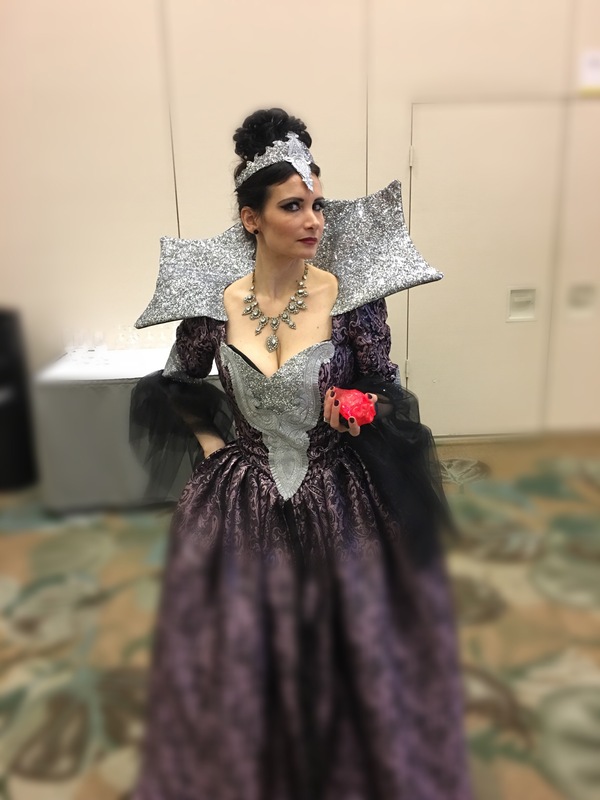 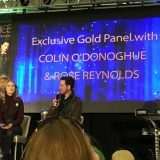 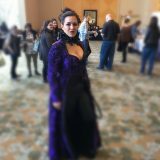 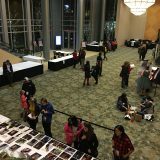 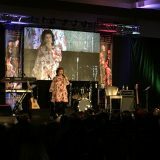 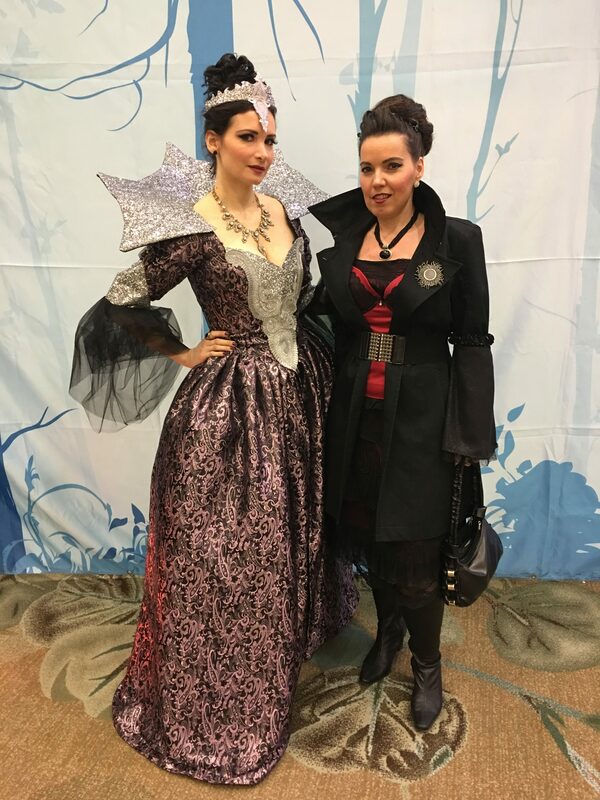 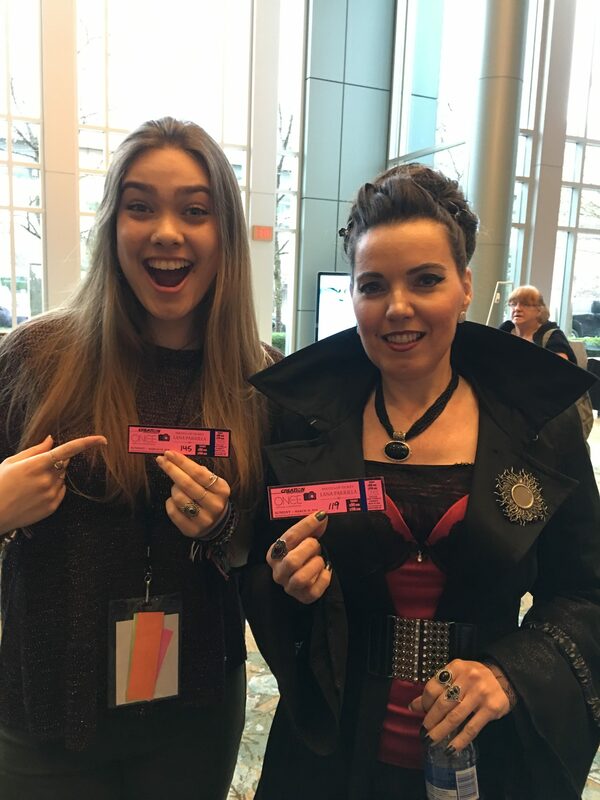 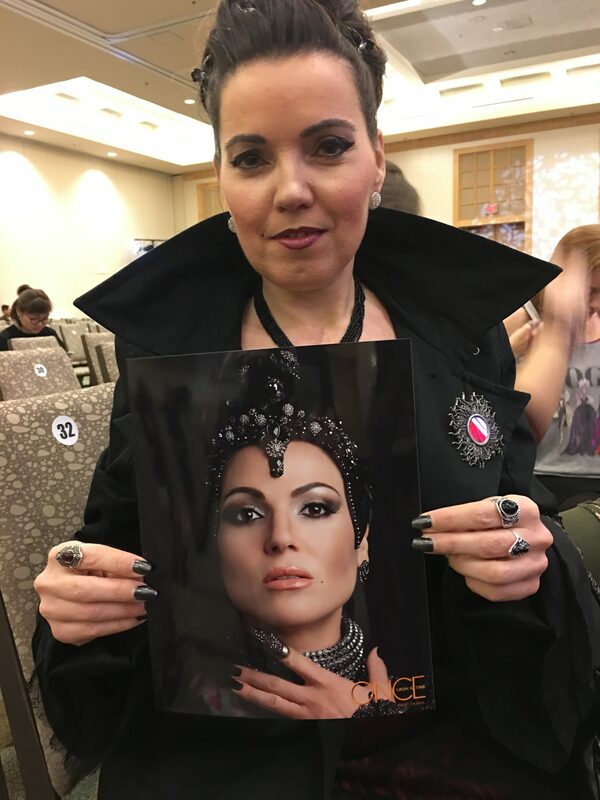 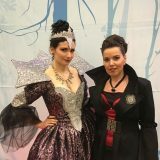 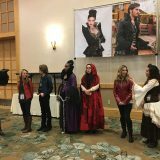 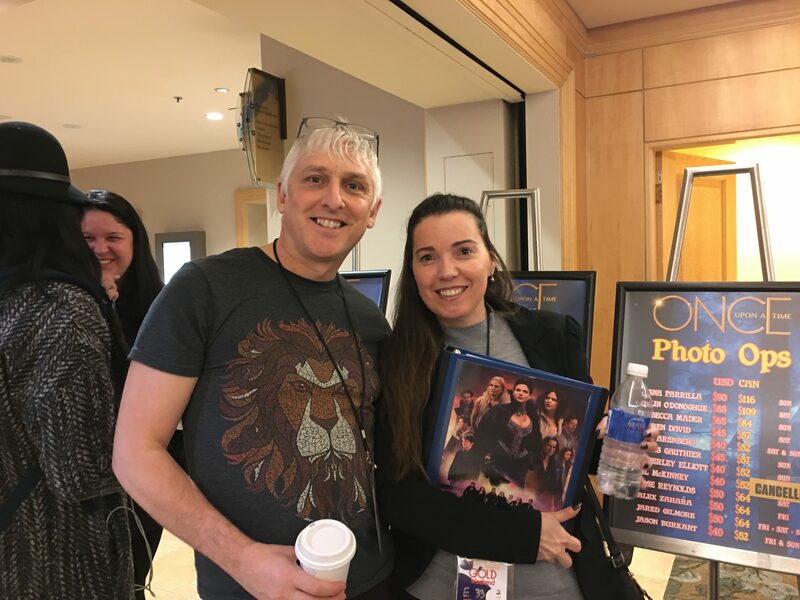 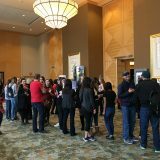 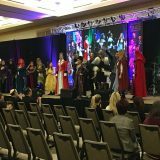 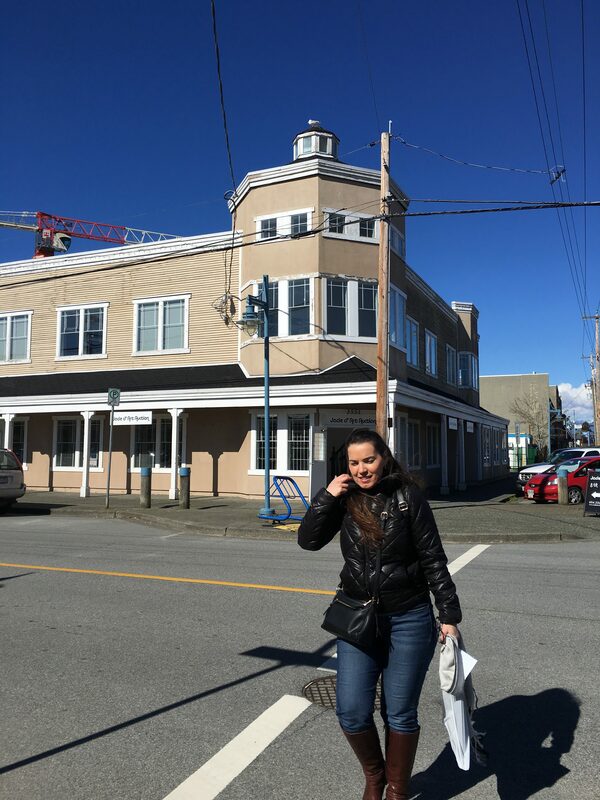 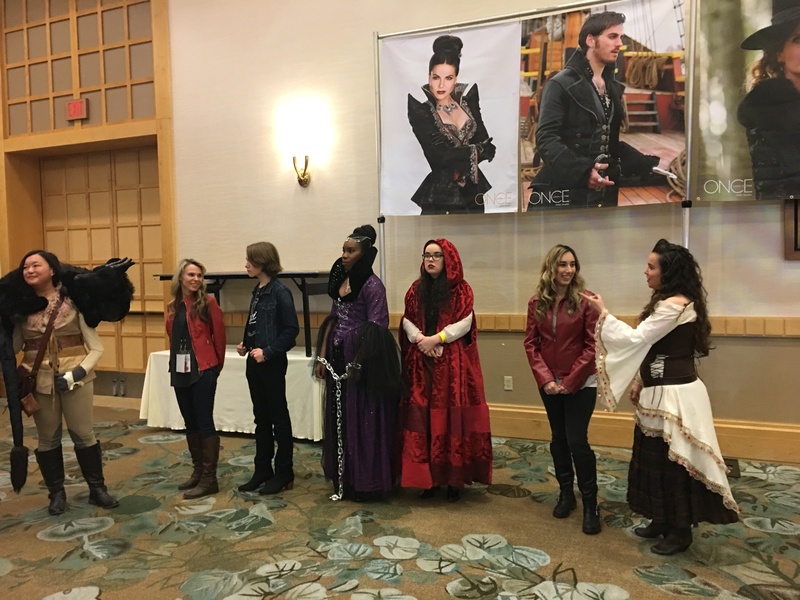 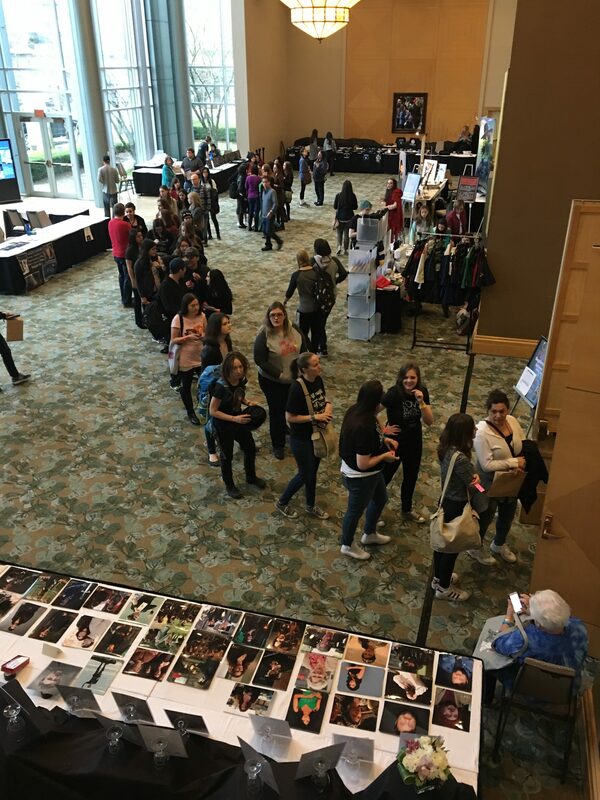 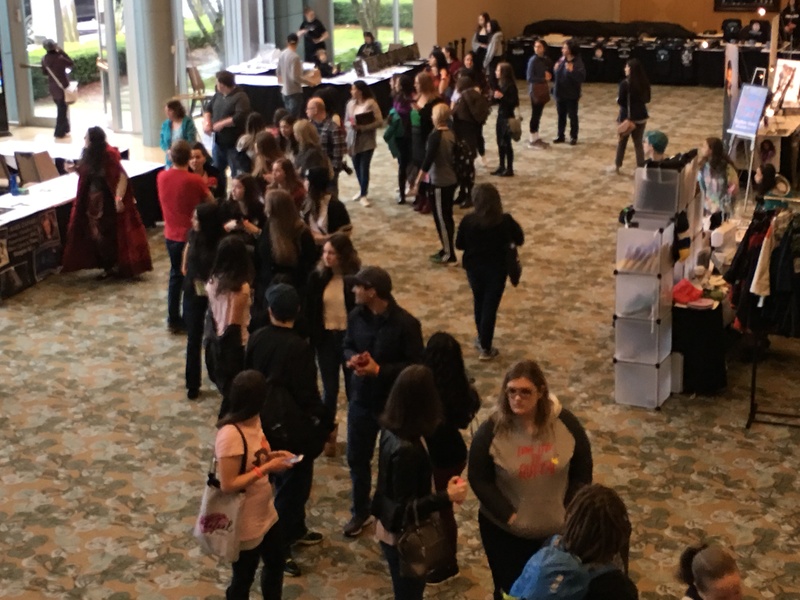 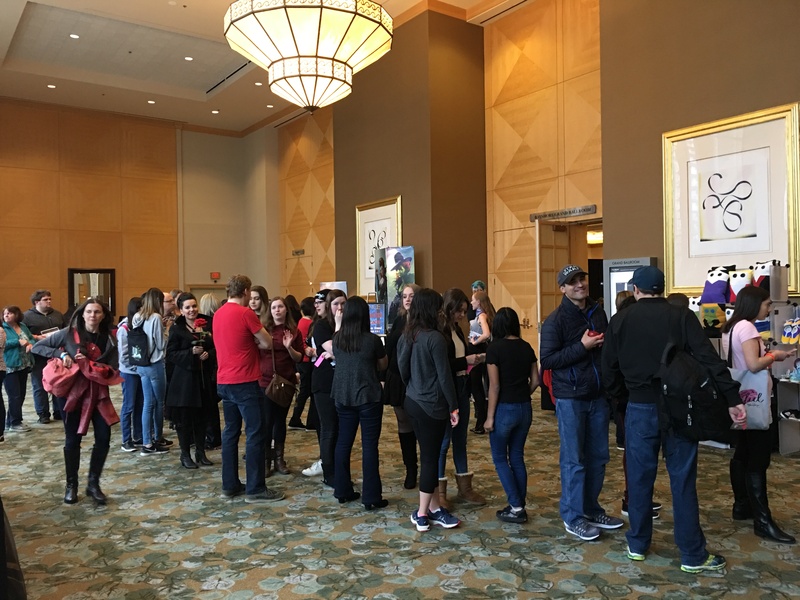 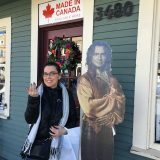 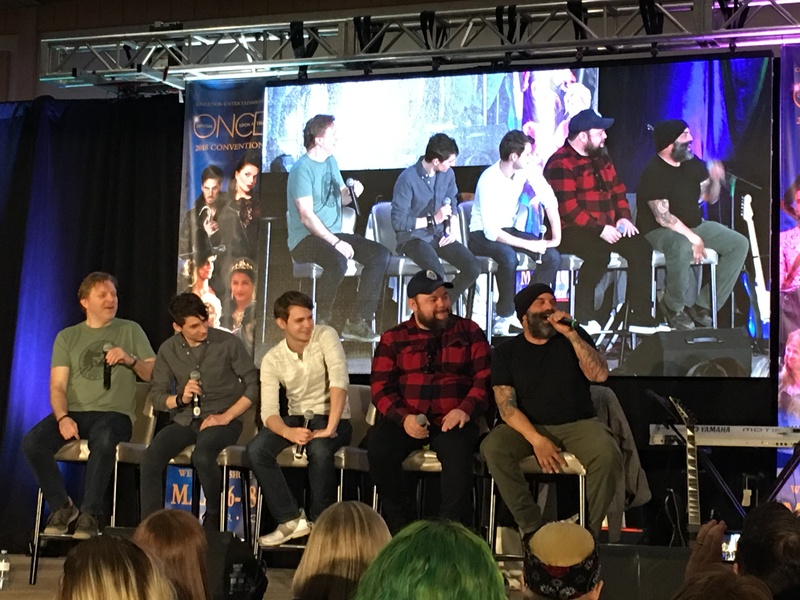 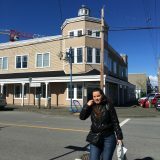 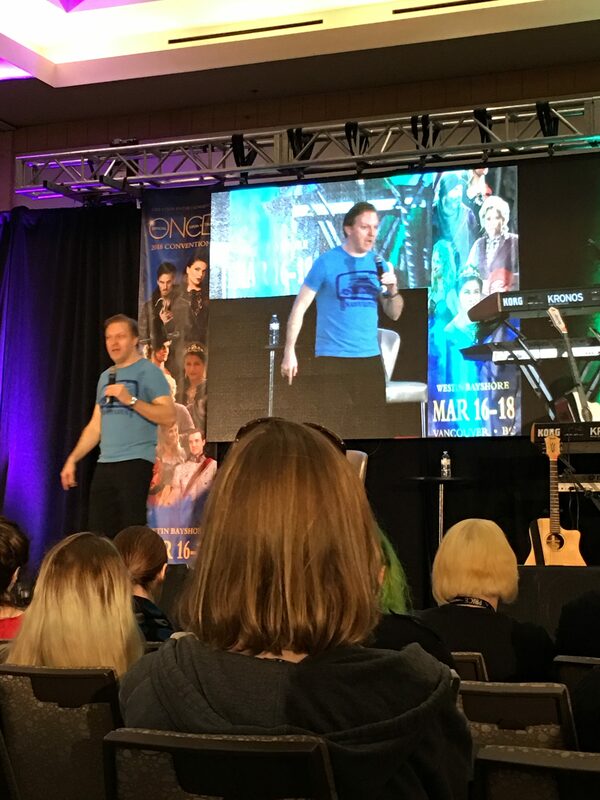 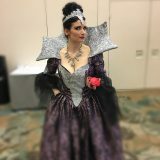 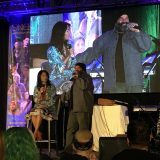 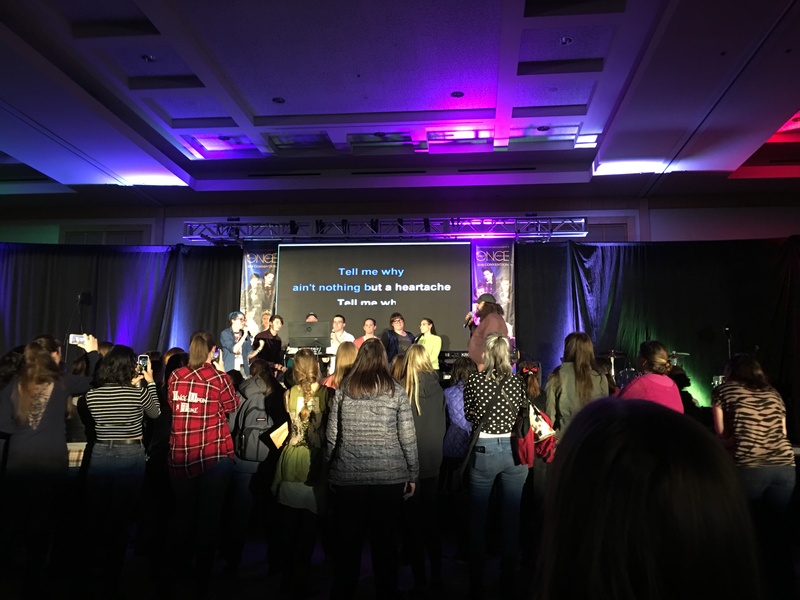 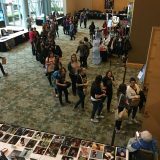 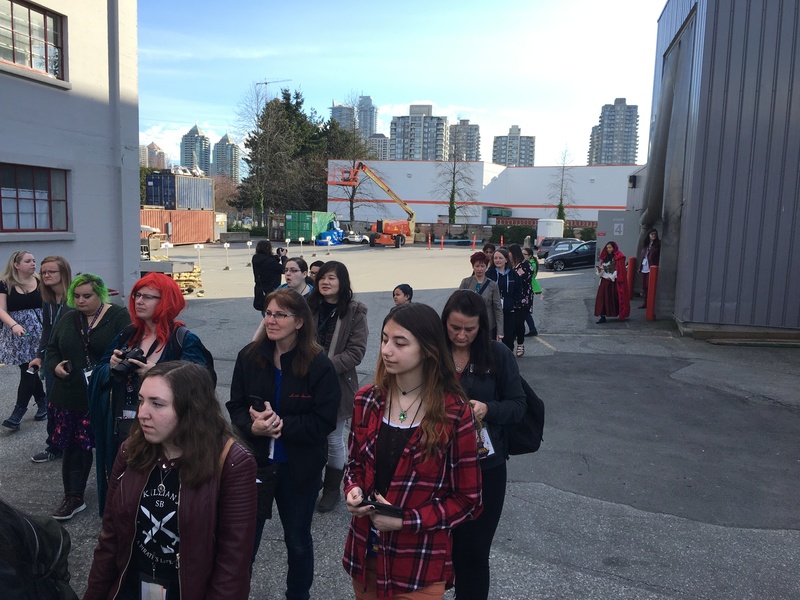 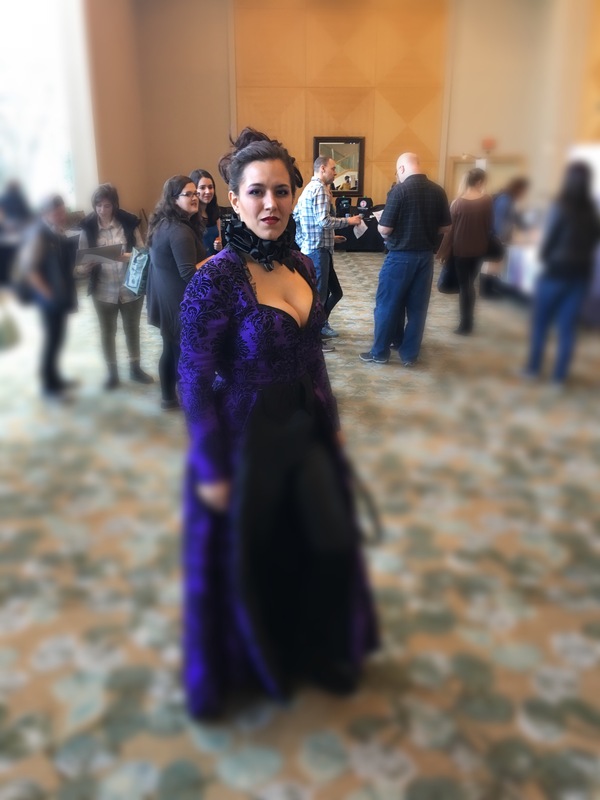 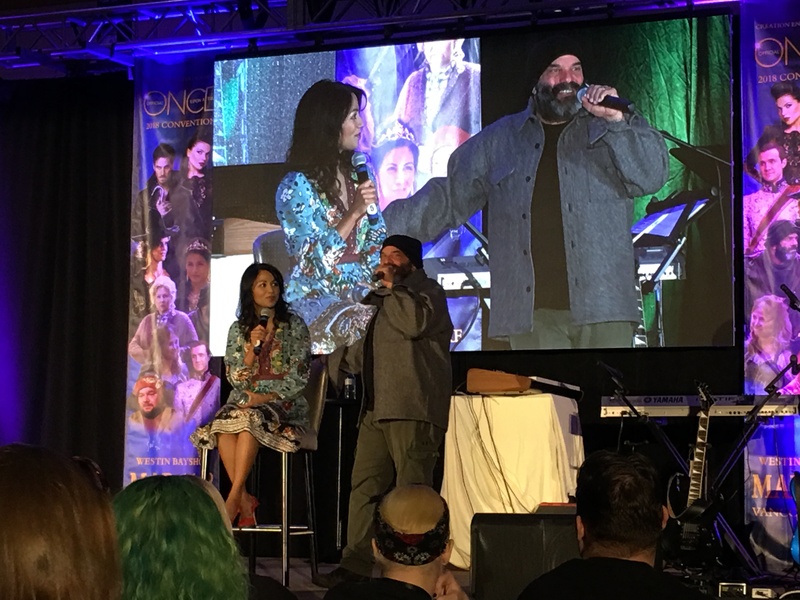 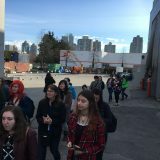 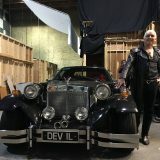 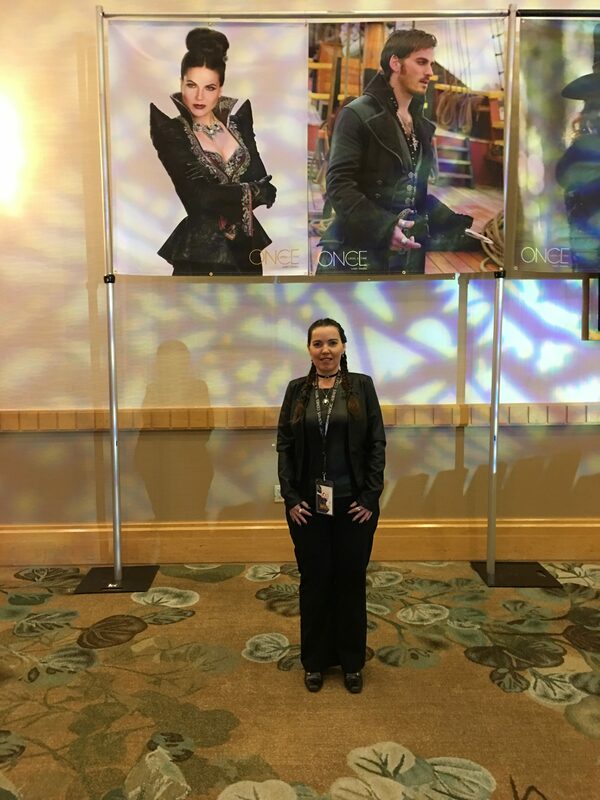 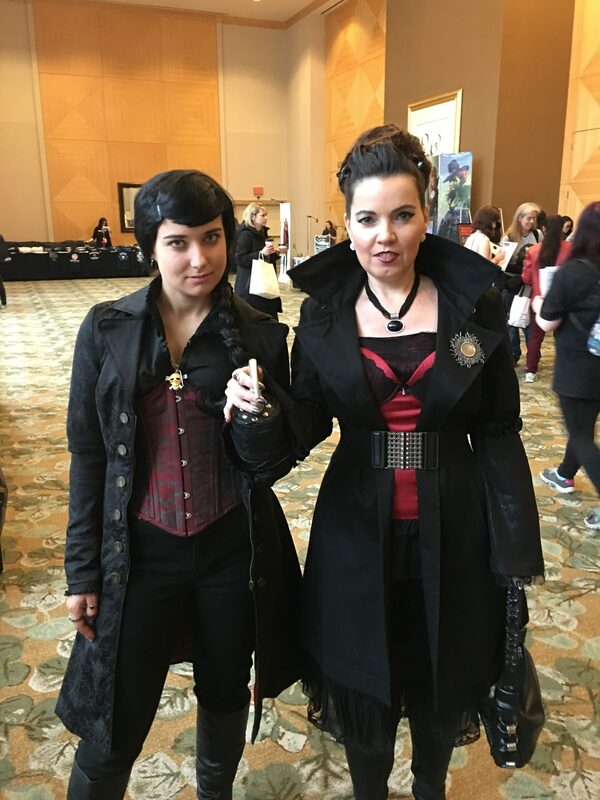 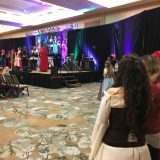 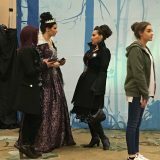 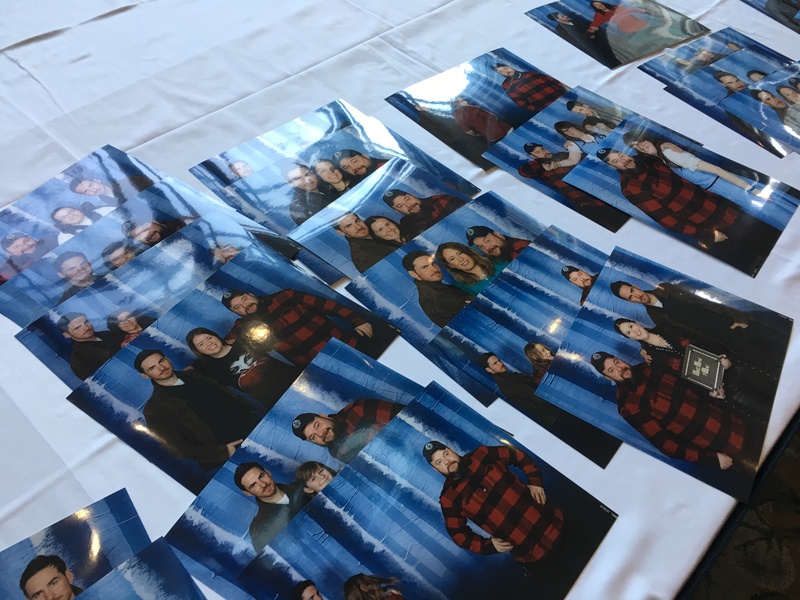 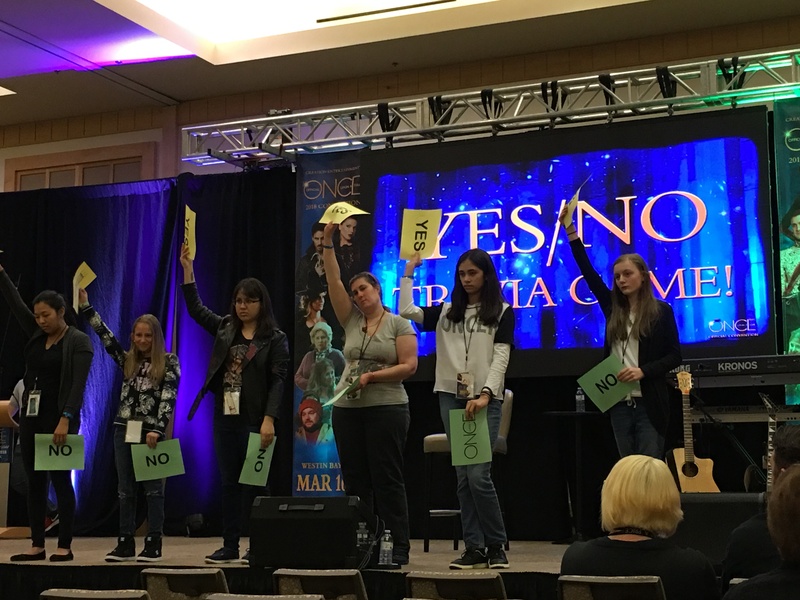 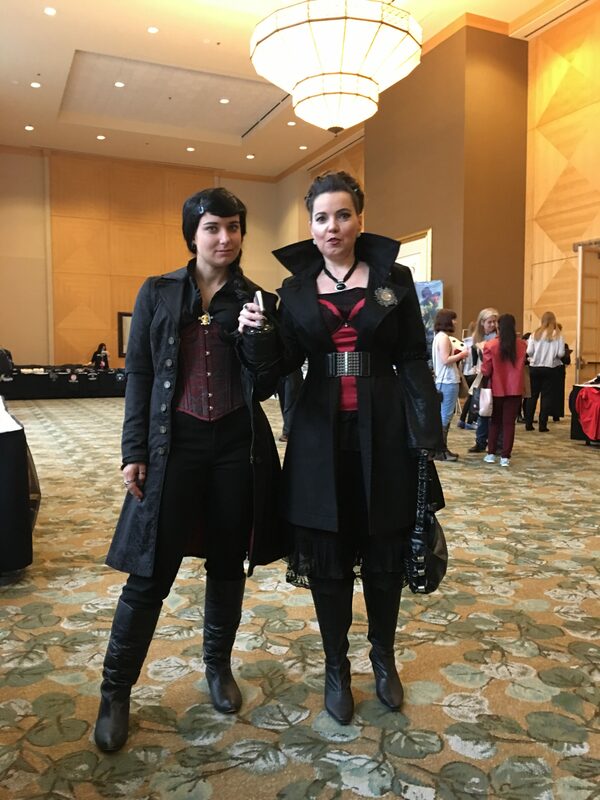 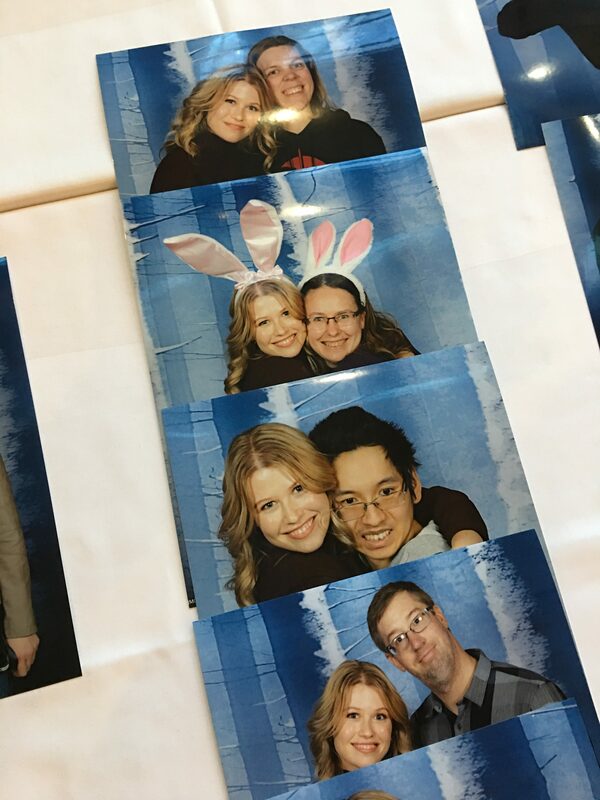 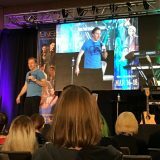 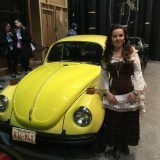 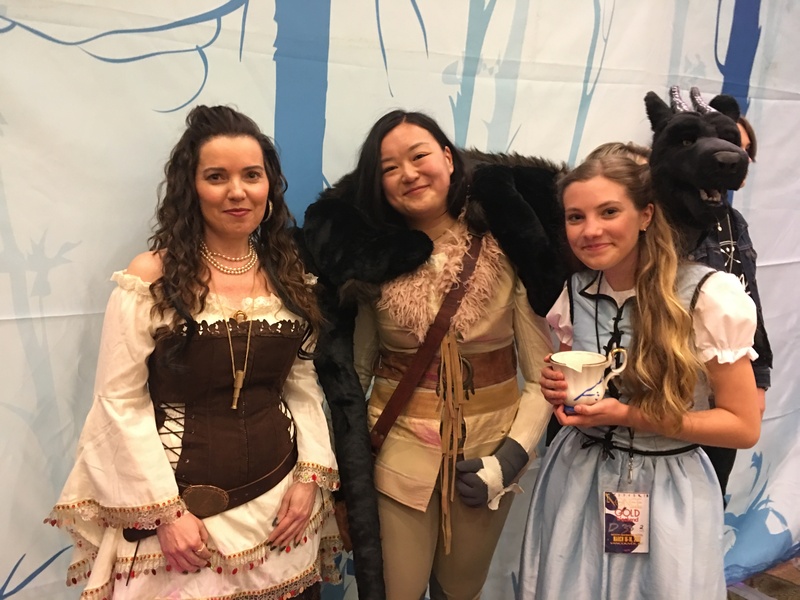 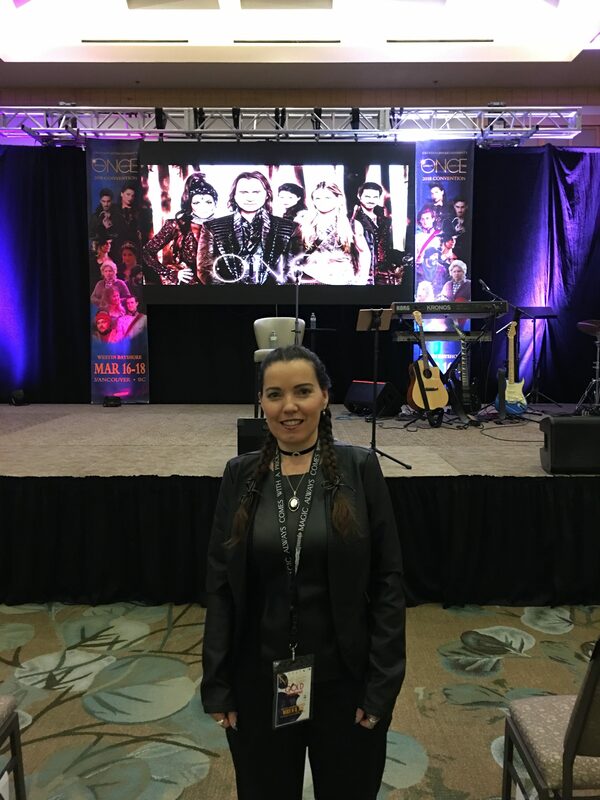 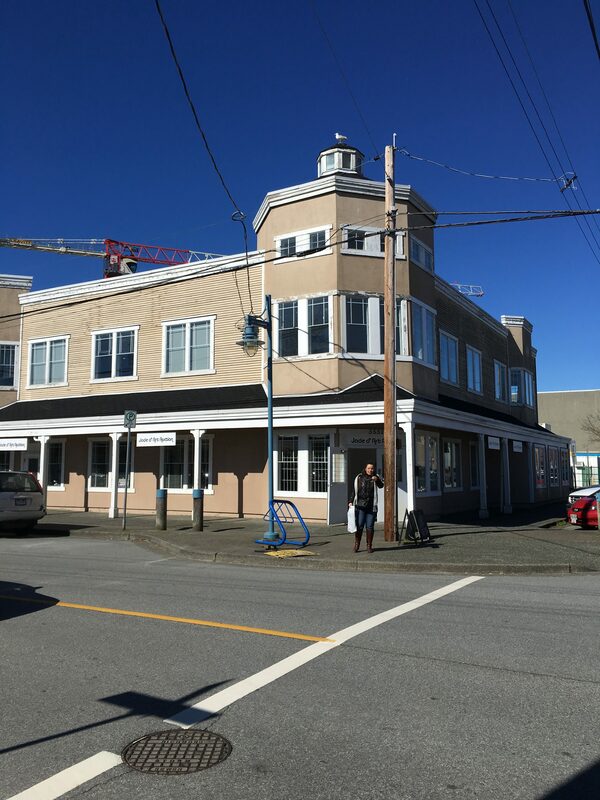 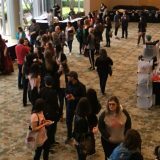 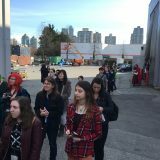 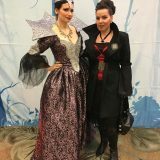 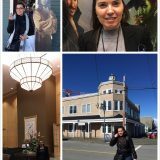 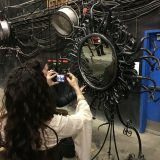 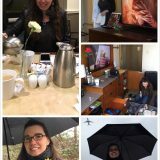 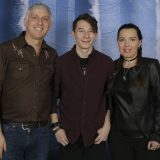 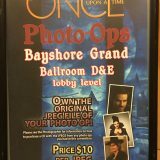 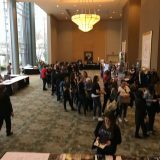 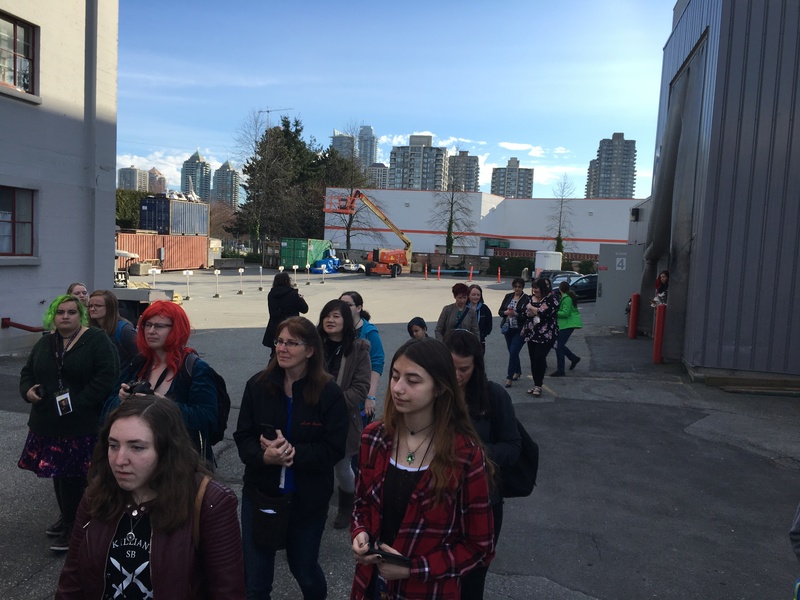 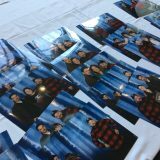 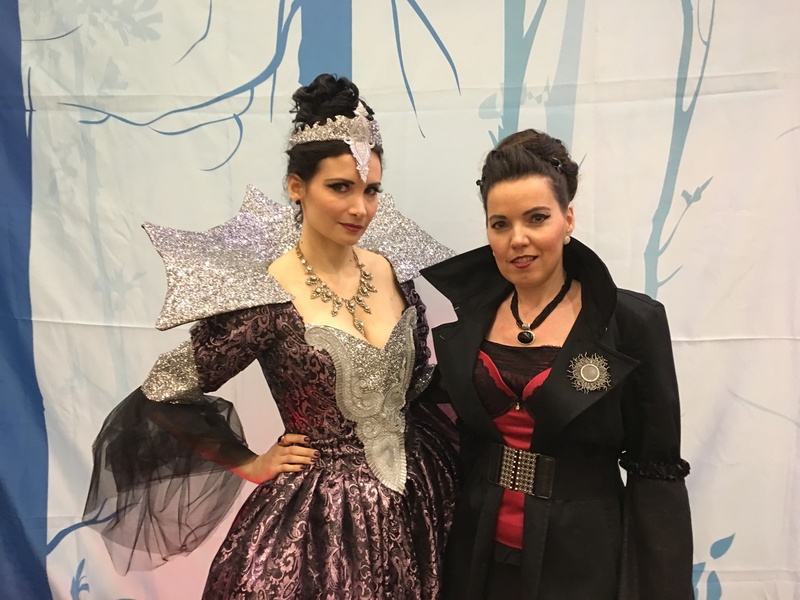 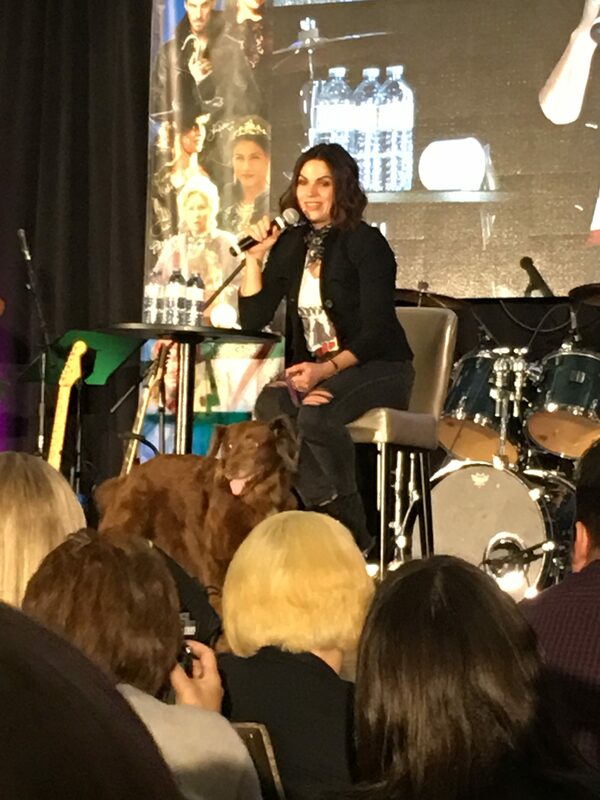 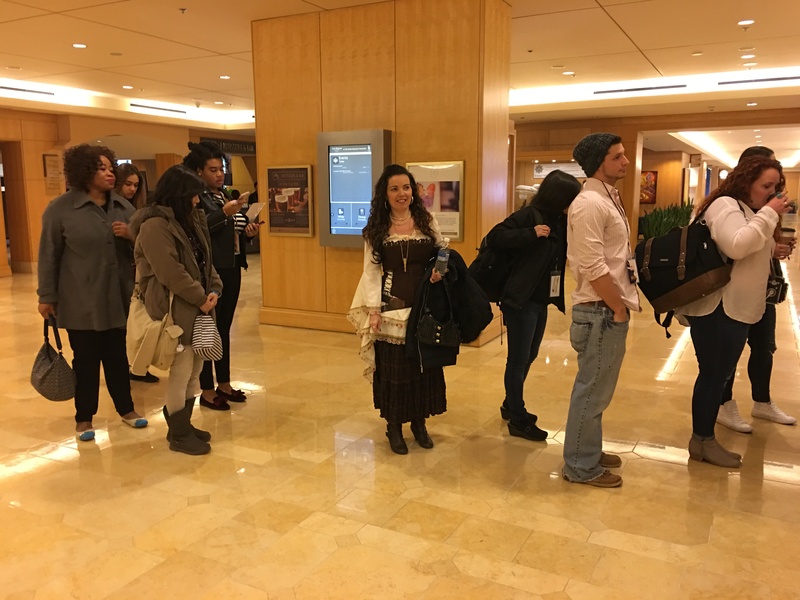 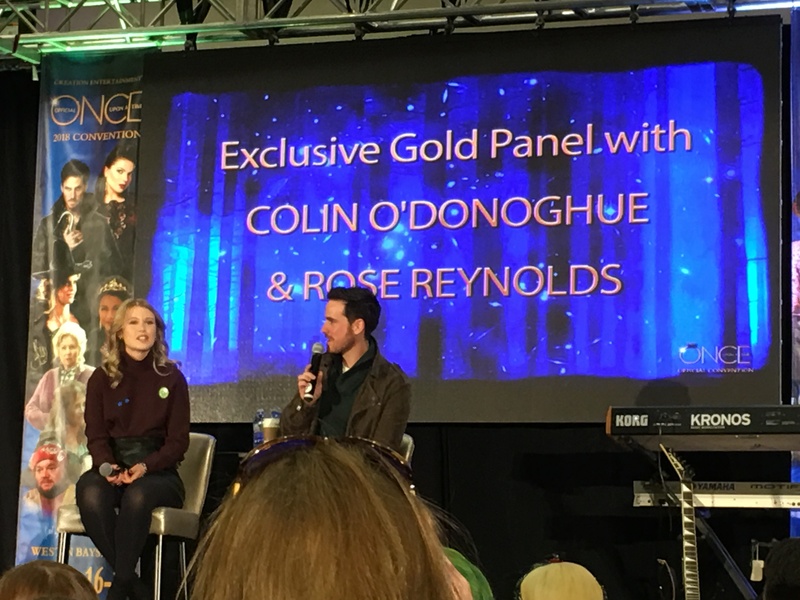 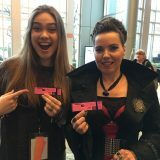 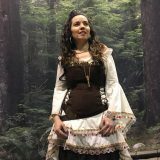 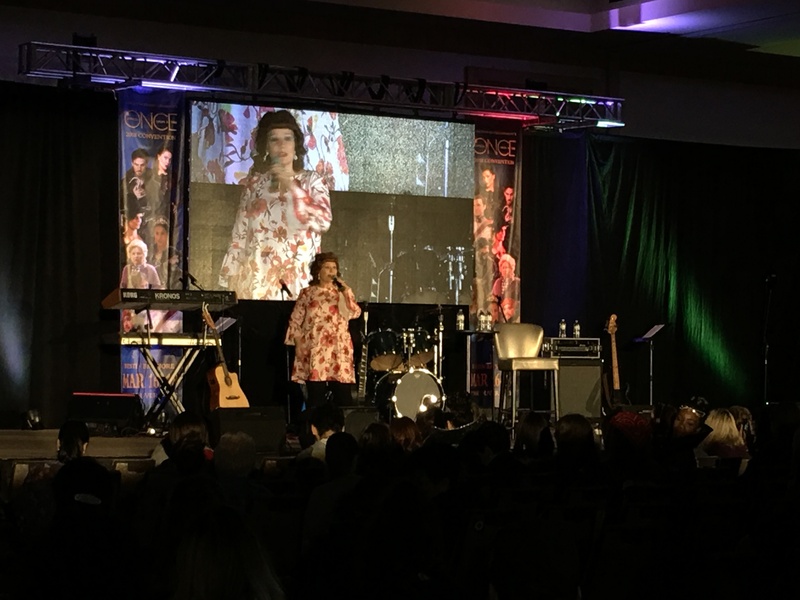 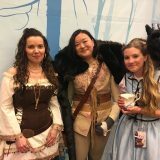 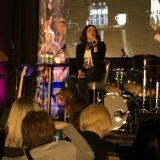 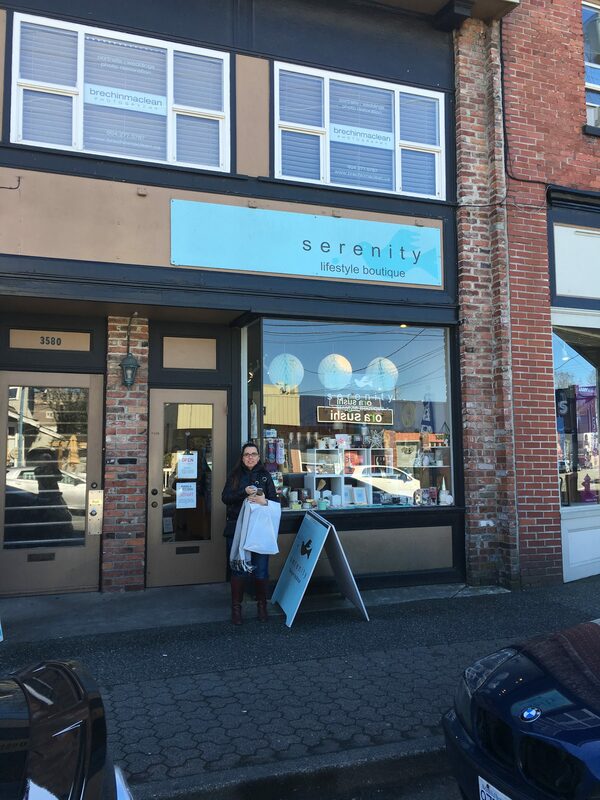 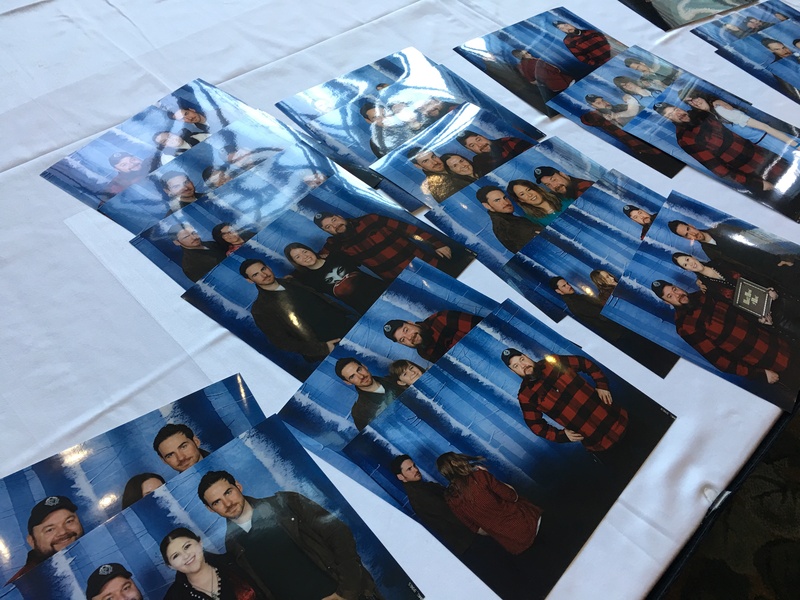 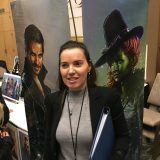 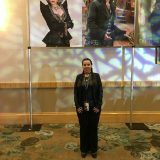 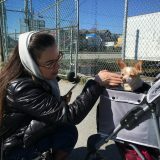 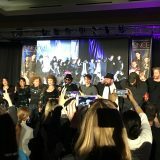 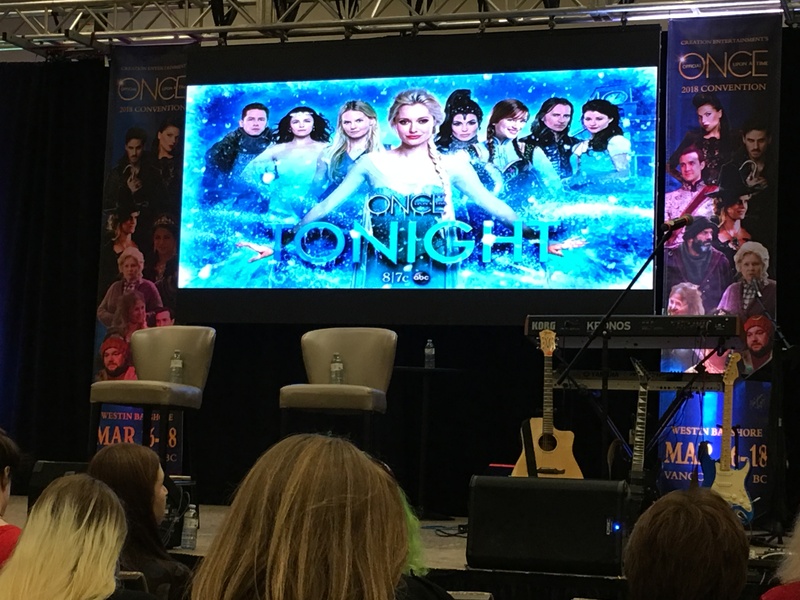 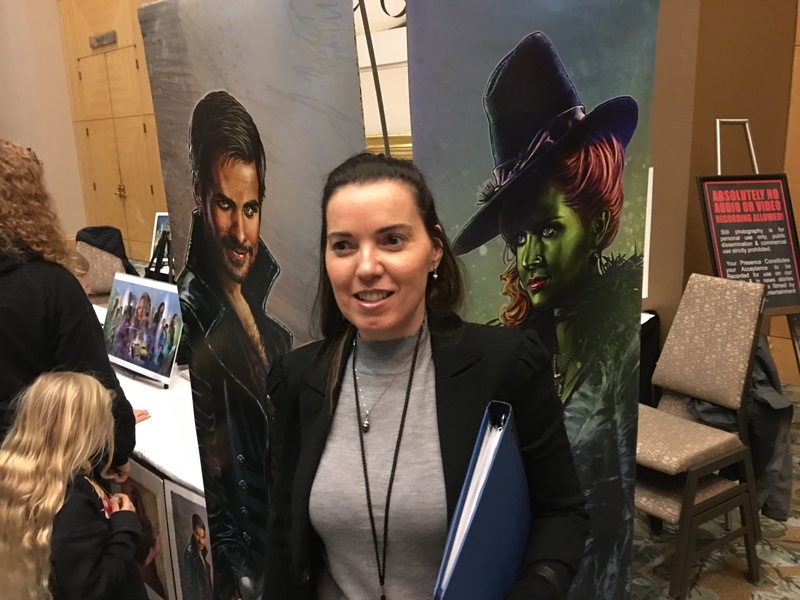 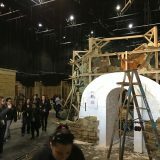 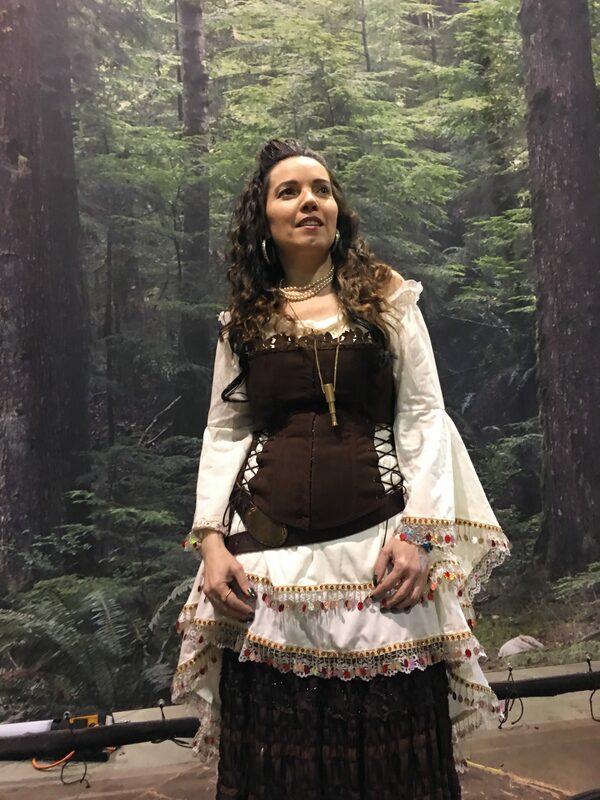 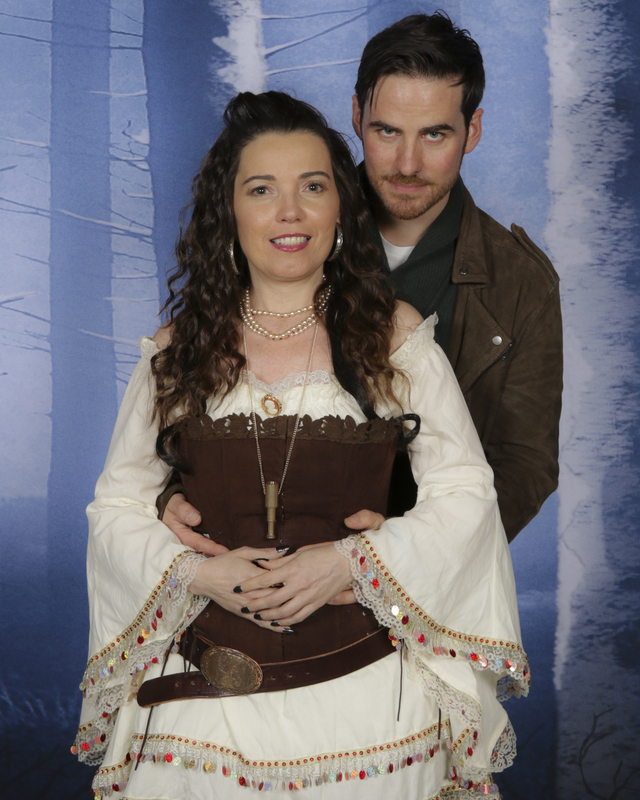 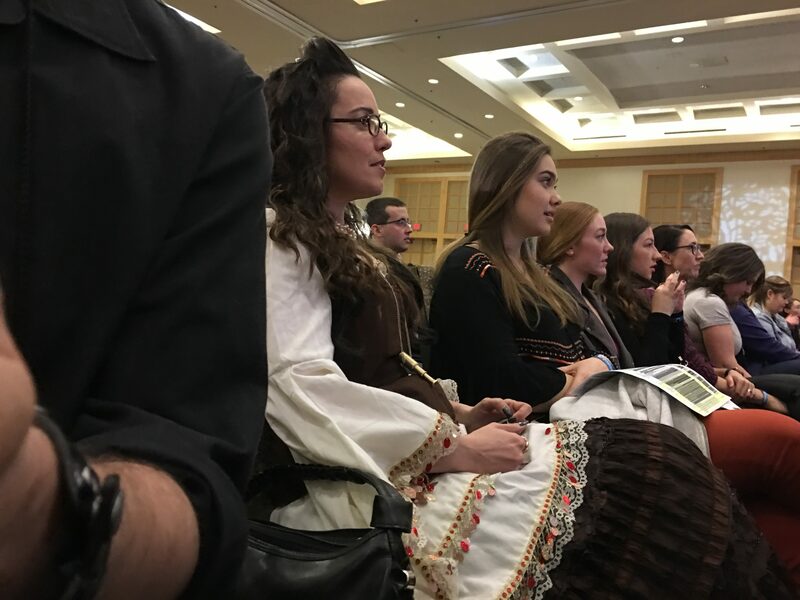 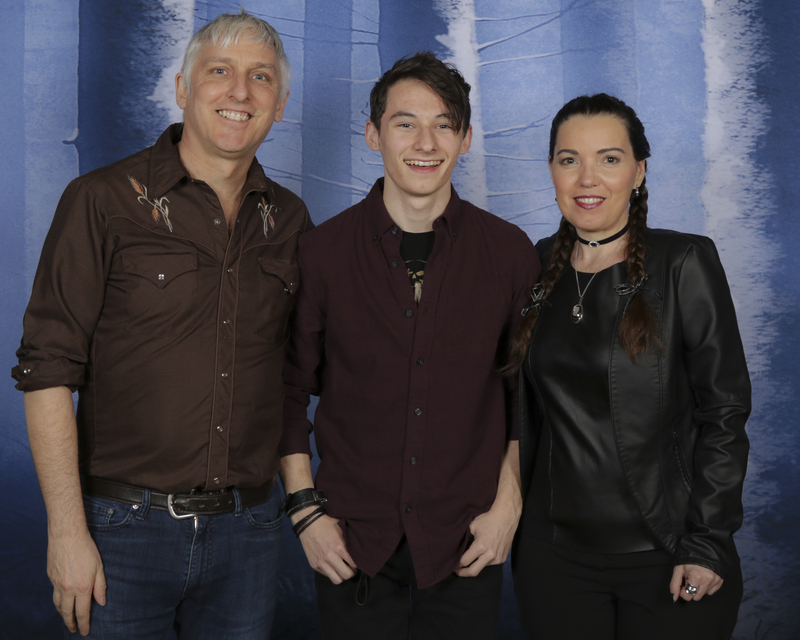 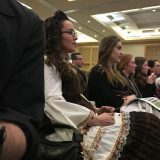 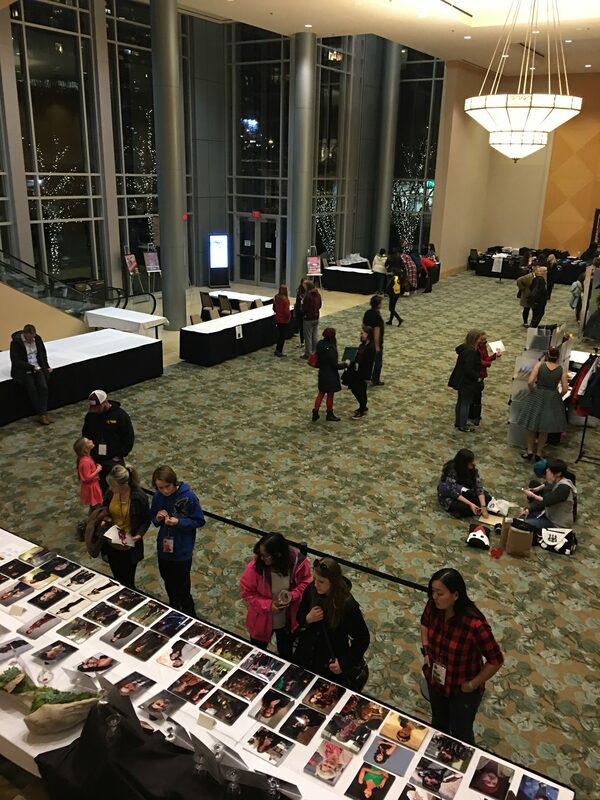 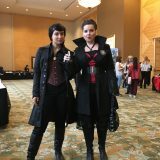 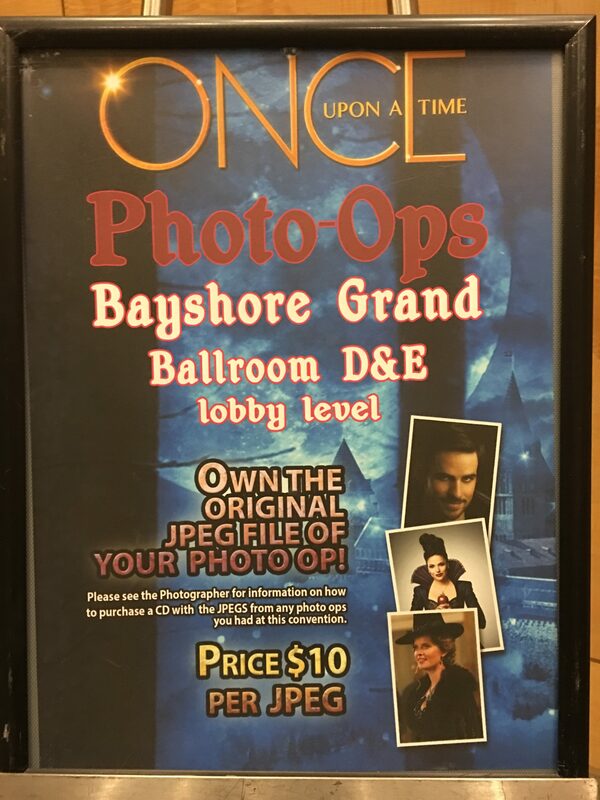 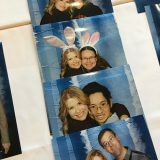 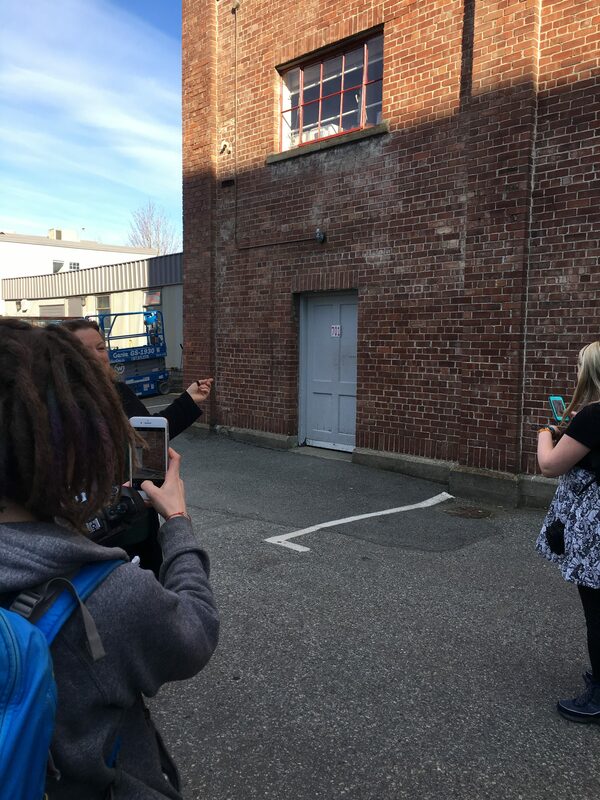 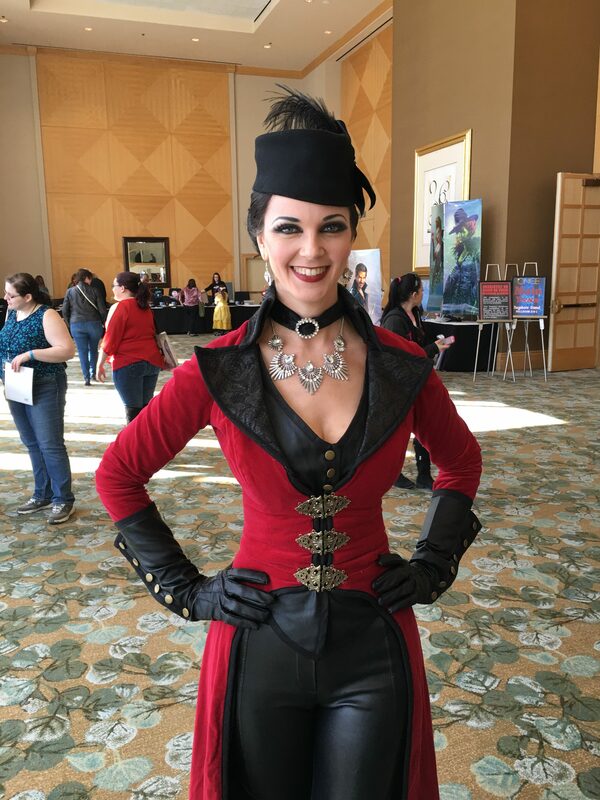 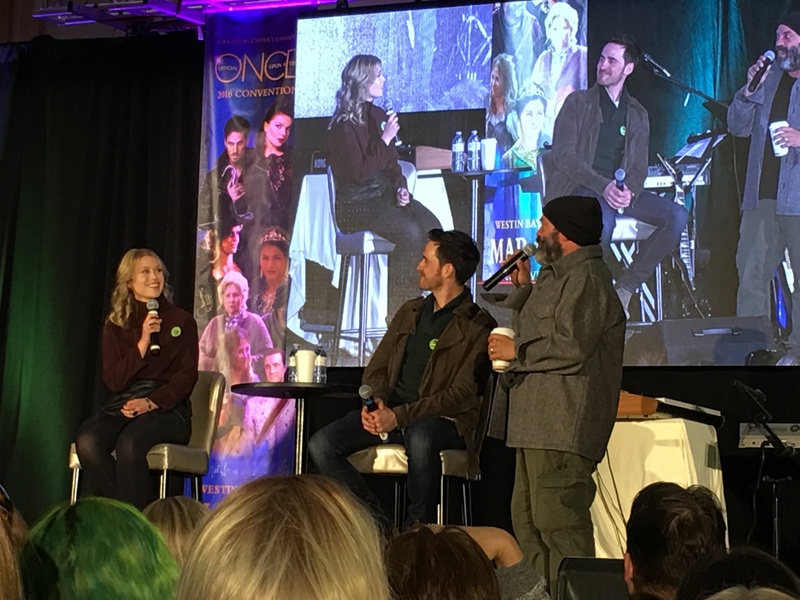 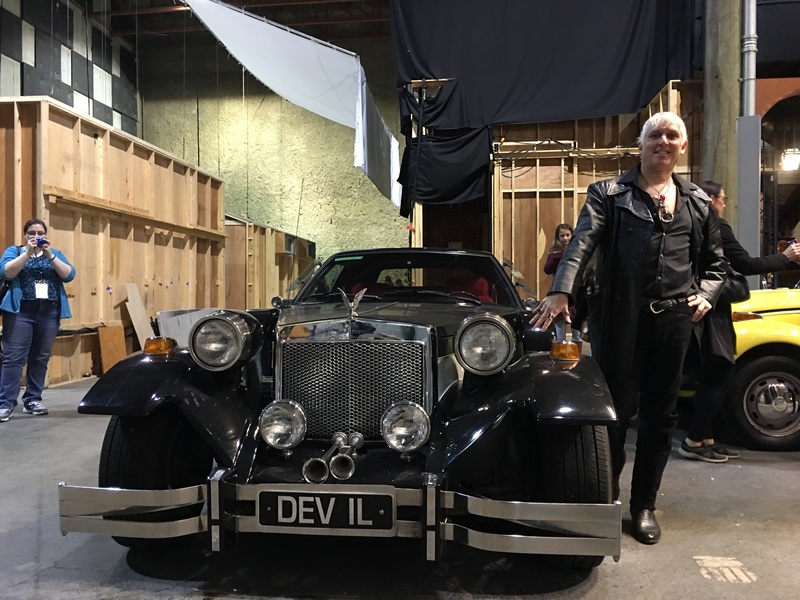 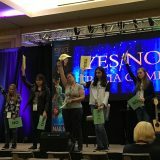 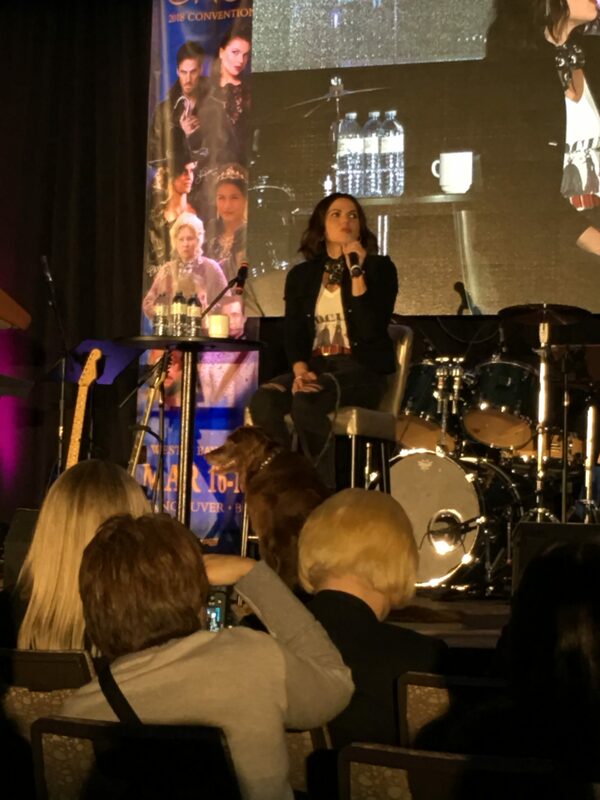 It was in February 2018 when we were at season 6 of the series when we happened to discover Creation Entertainment was holding a OUAT Conference in Vancouver in March 2018 and we were so totally in love with the show that we decided, for once upon a time, to go to one of these conferences. 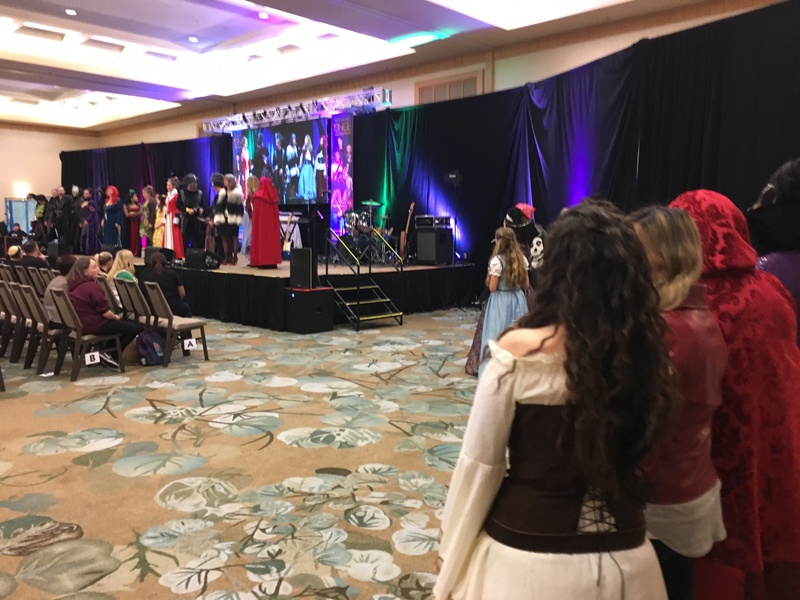 Watching Once Upon A Time while we waited for the conference to start. 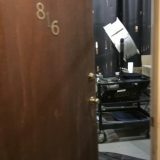 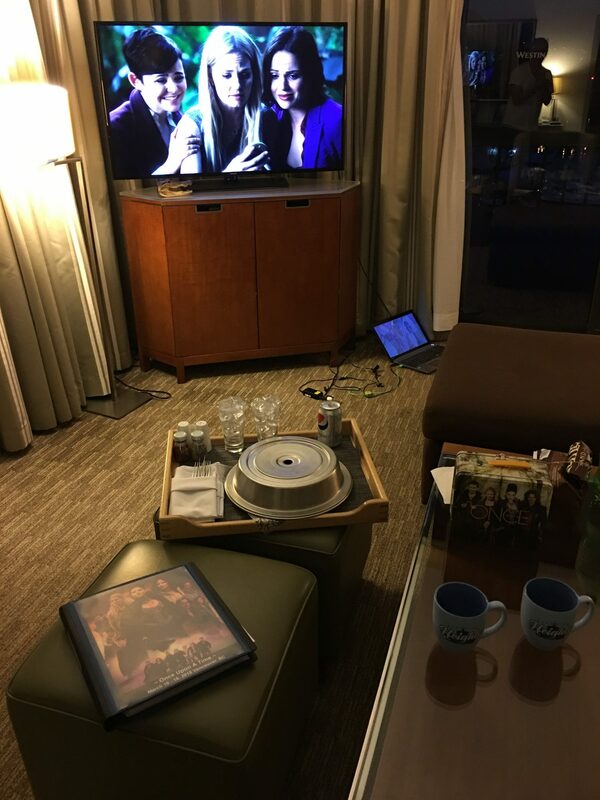 We watched episodes every night at the hotel! 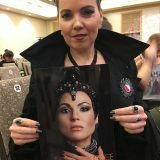 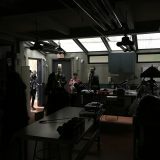 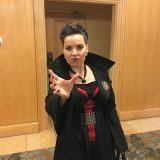 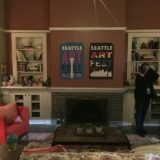 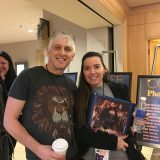 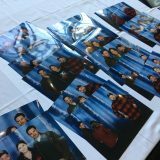 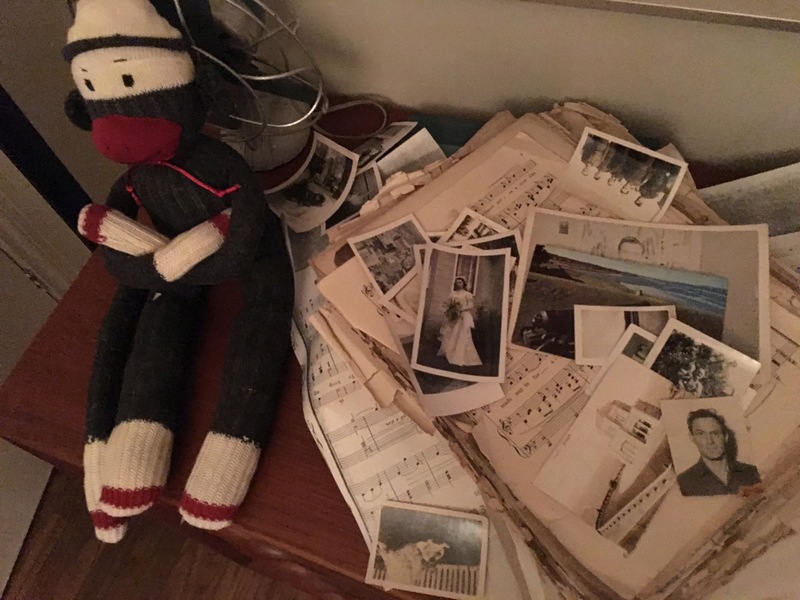 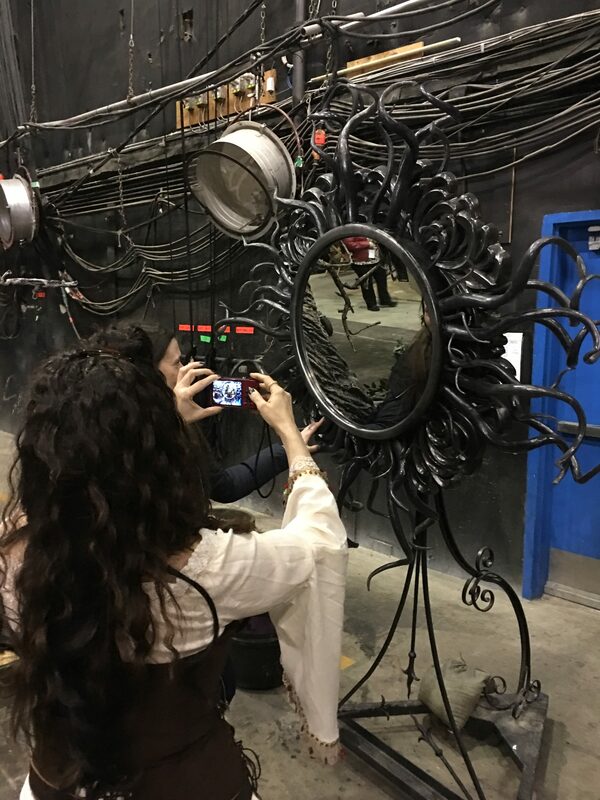 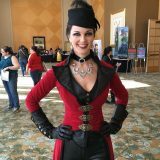 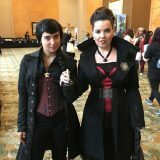 We bought our tickets less than a month before the event and were so excited to start planning our costumes and what we would do during our photo-ops with the actors from the show. 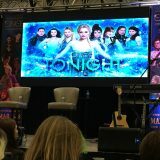 For anyone who doesn’t know, these events involve the cast members getting together with fans to have big gathering to celebrate the show and get to have up close and personal meetings with the characters of the show. 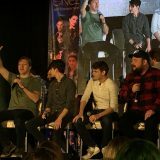 We didn’t really know what to expect because we’ve never been to one of these “comic-con” type shows before so were real noobs which added to the anticipation and excitement! 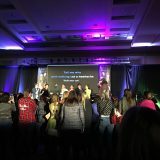 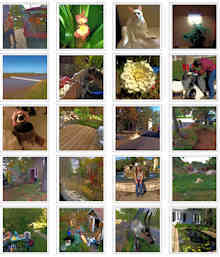 We had a great time at the conference. 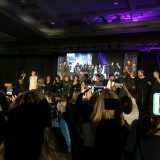 The organization of the weekend was top-notch, it was professional and fun. 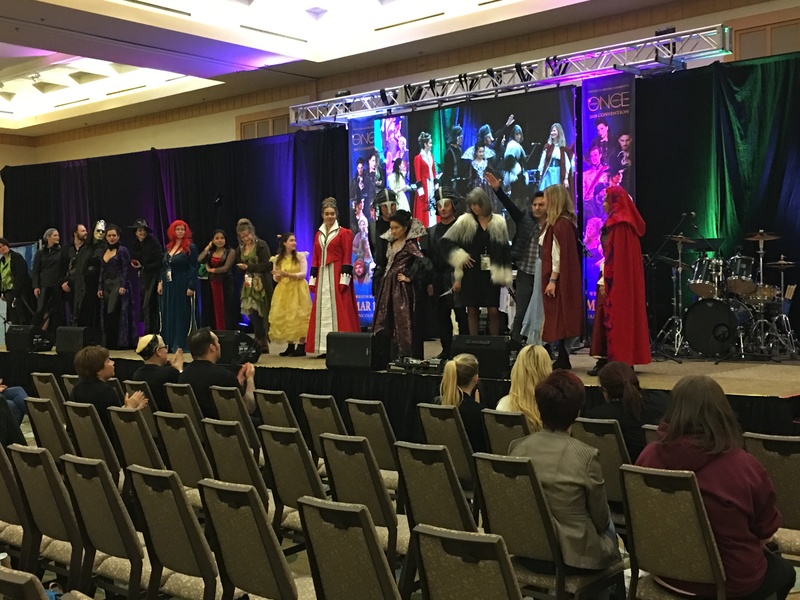 We had Gold Tickets and had an amazing time meeting new people and enjoyed the costumes, the guests, and the entire event was unforgettable! 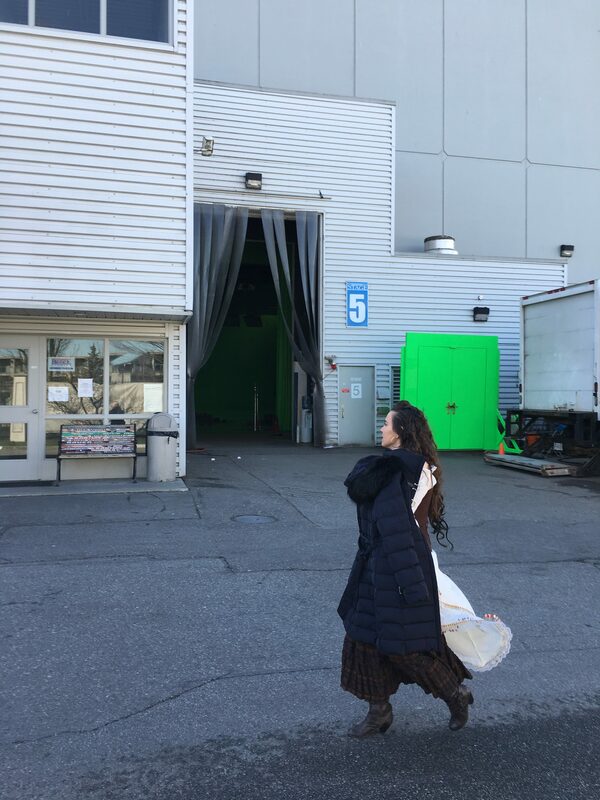 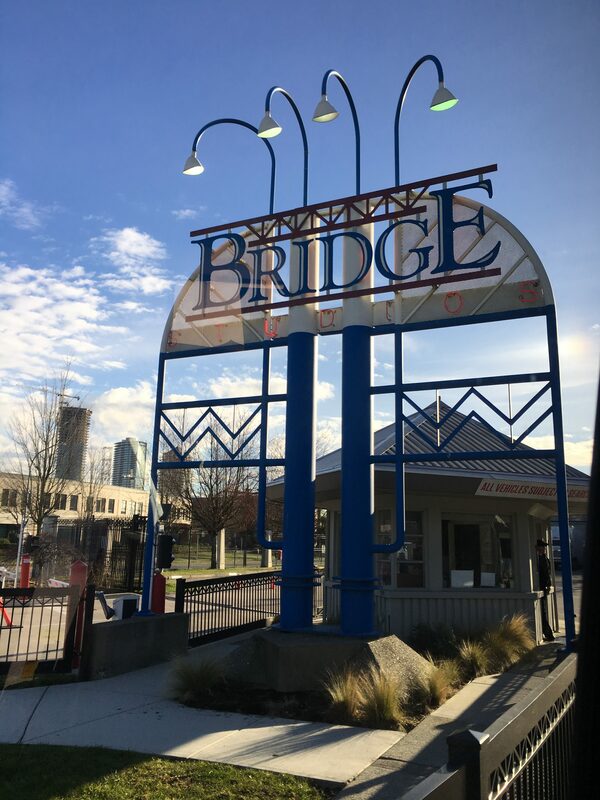 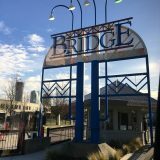 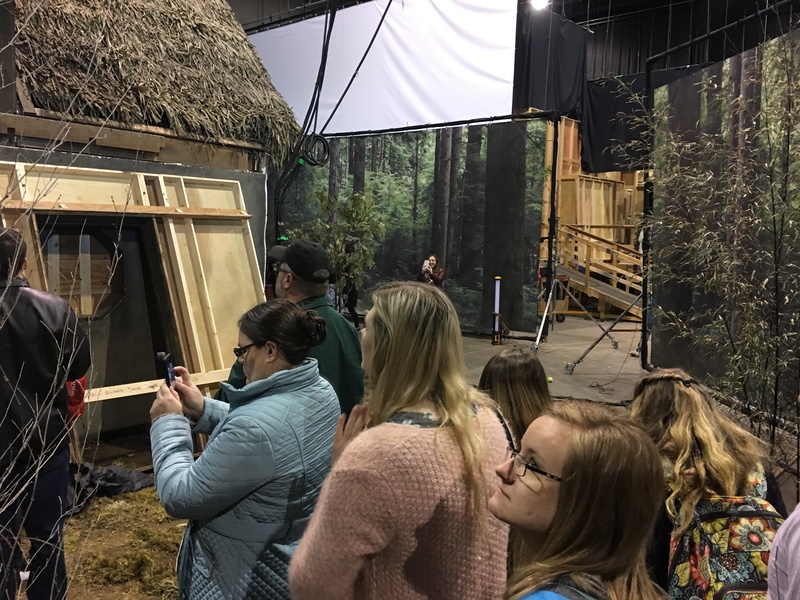 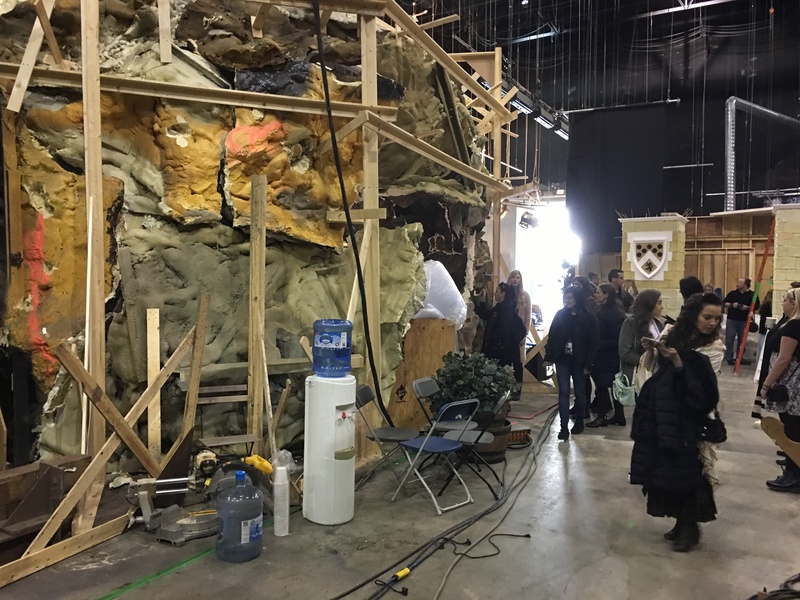 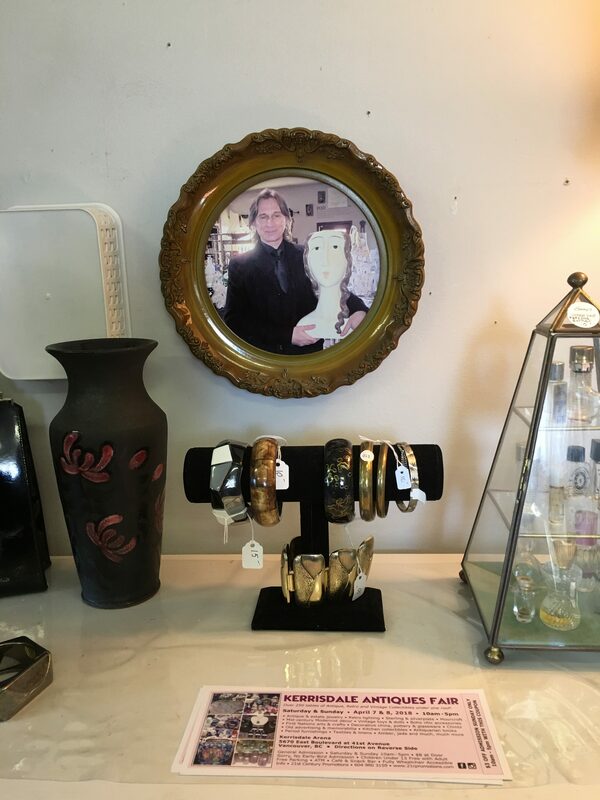 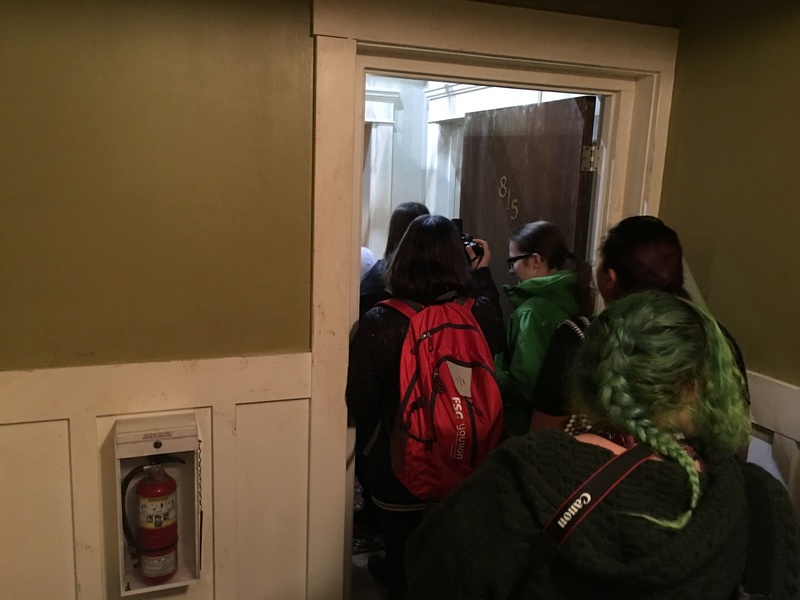 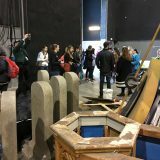 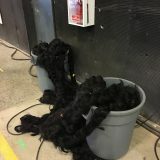 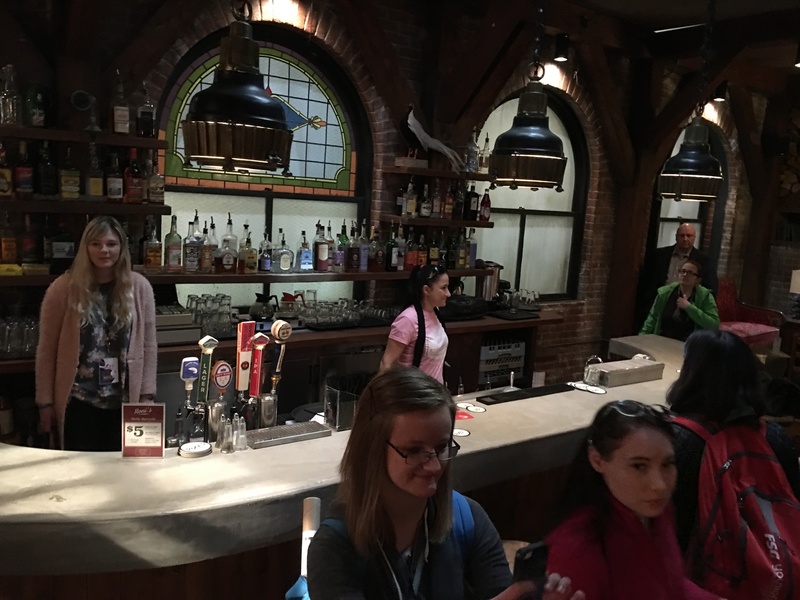 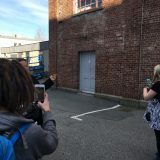 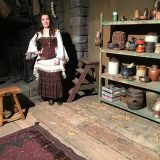 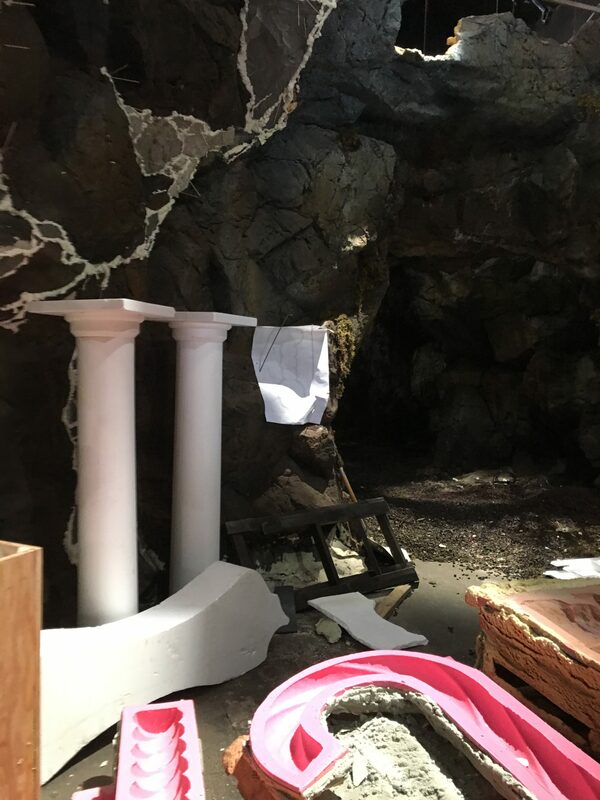 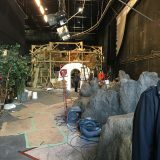 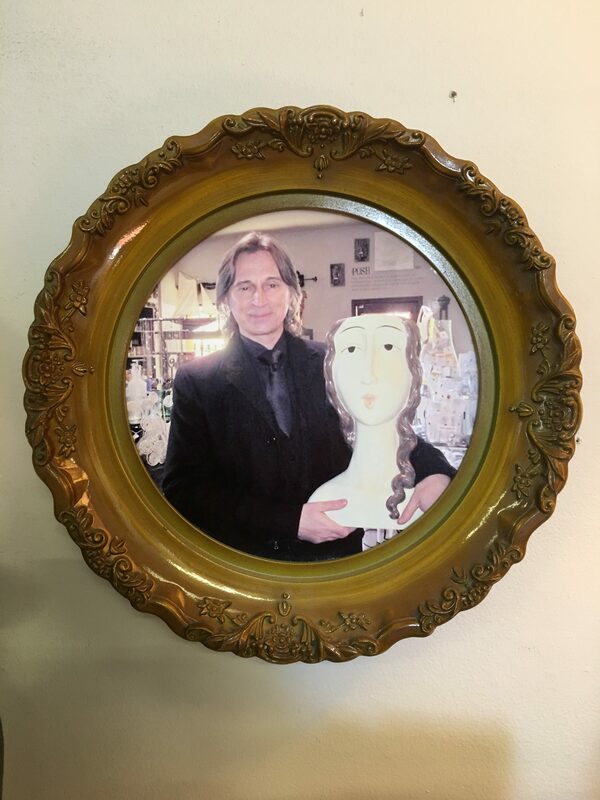 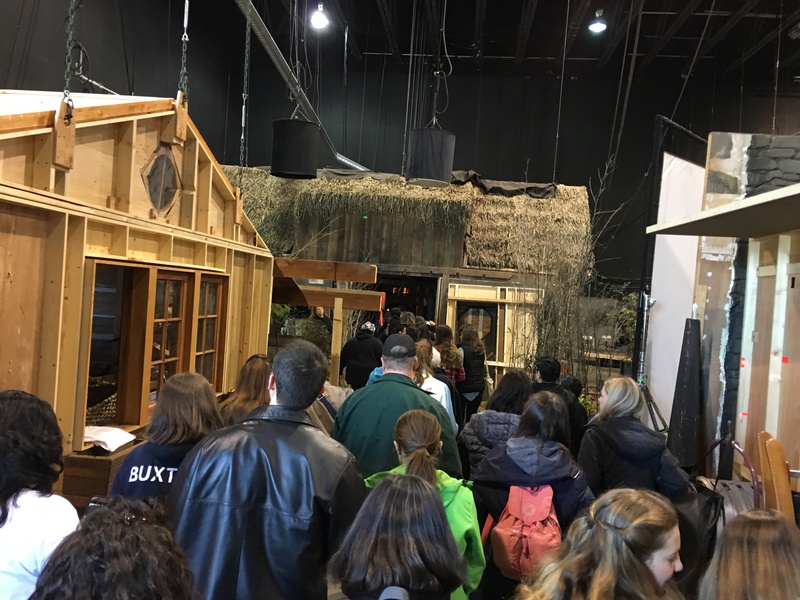 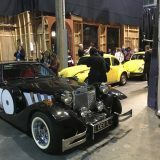 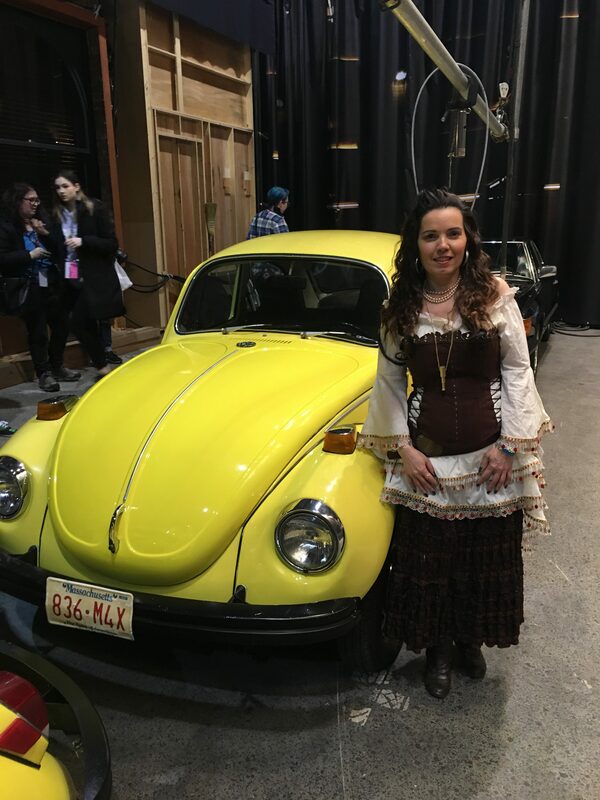 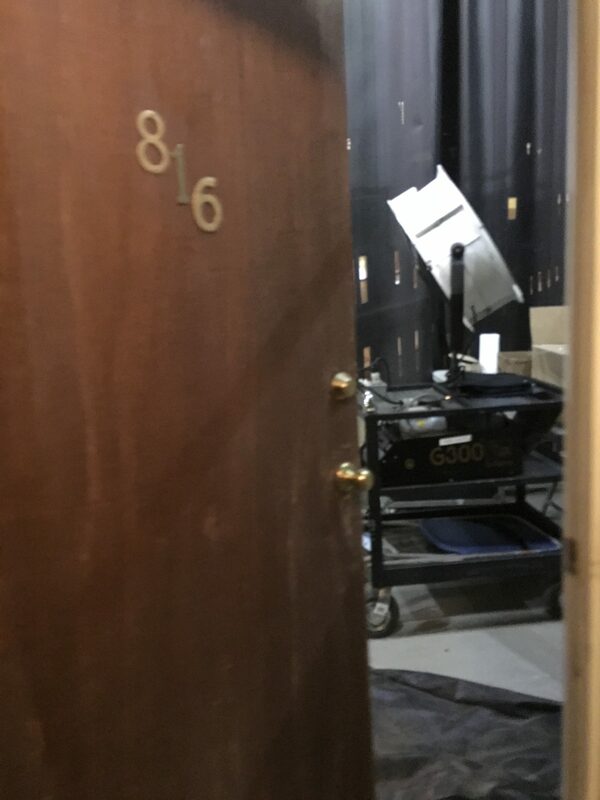 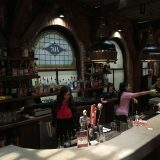 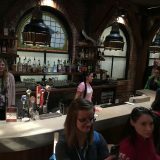 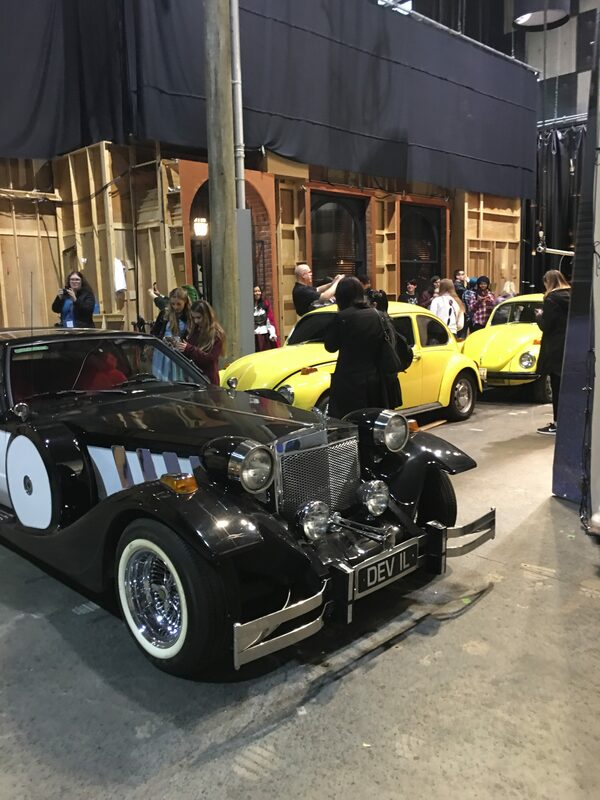 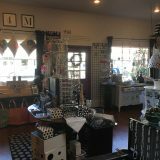 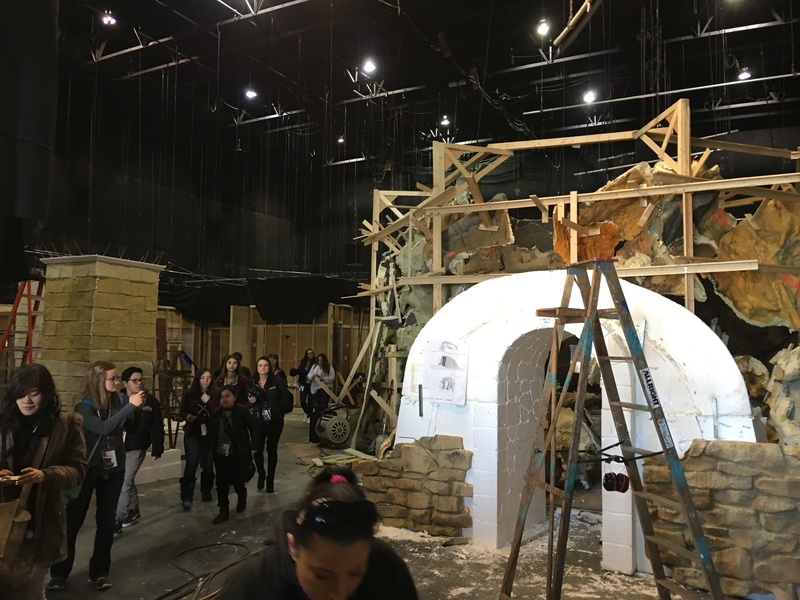 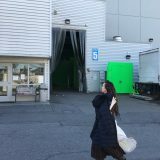 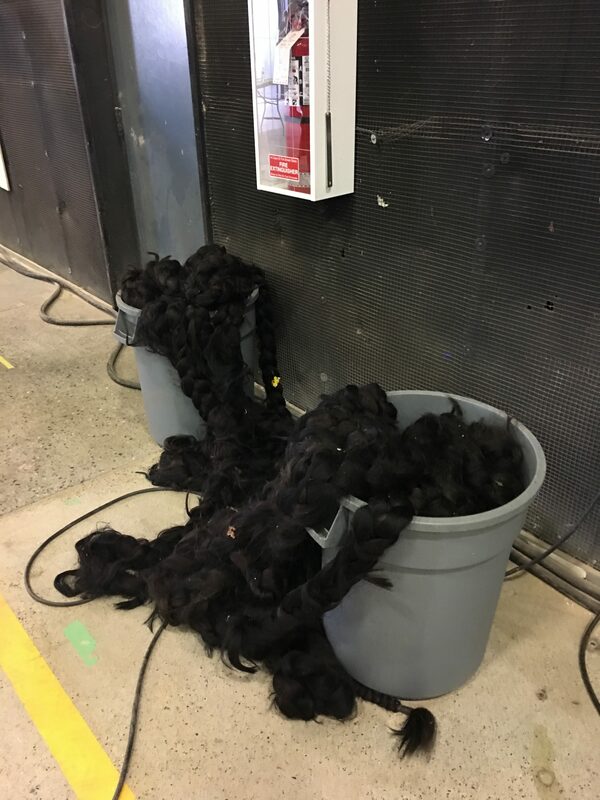 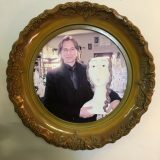 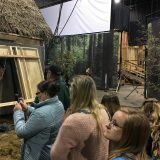 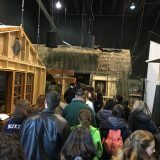 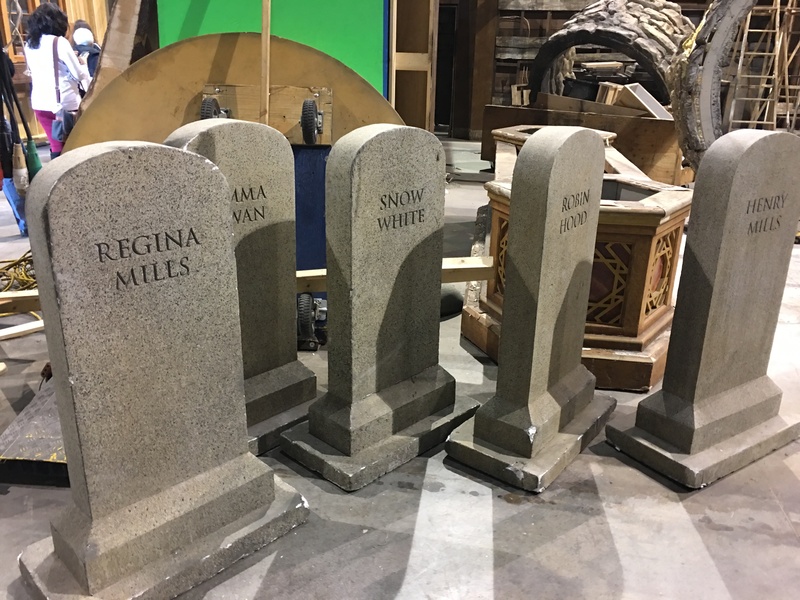 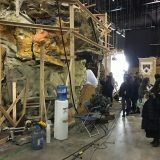 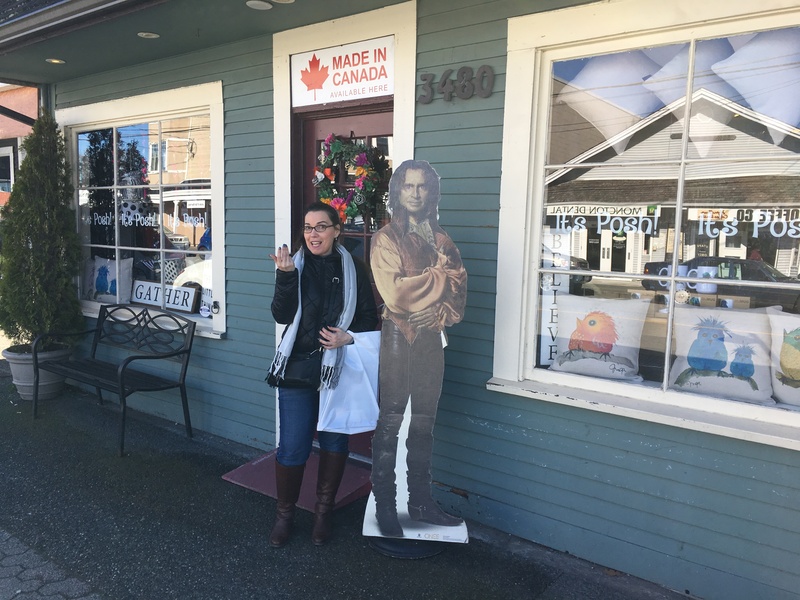 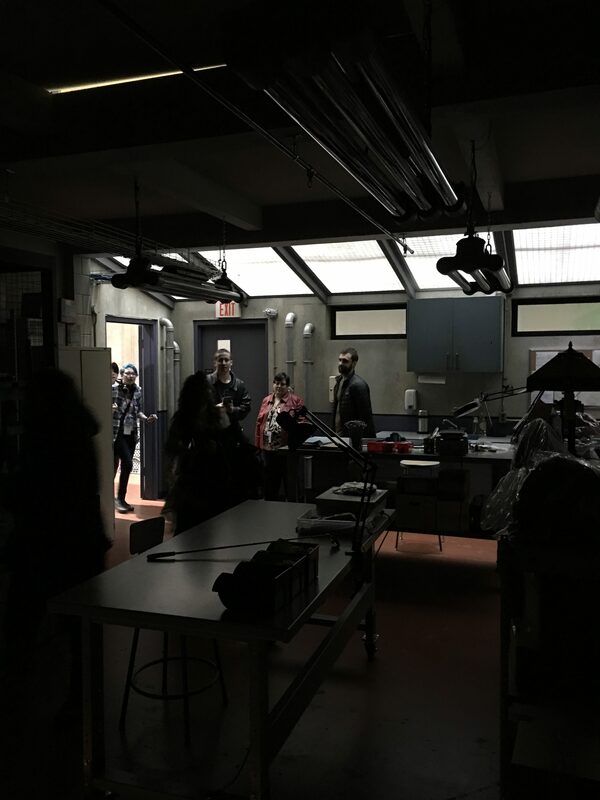 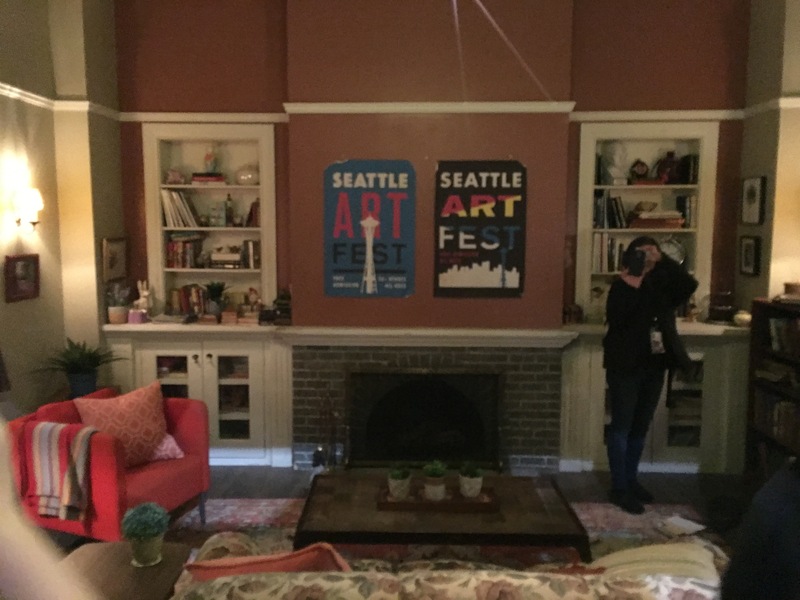 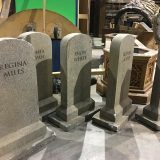 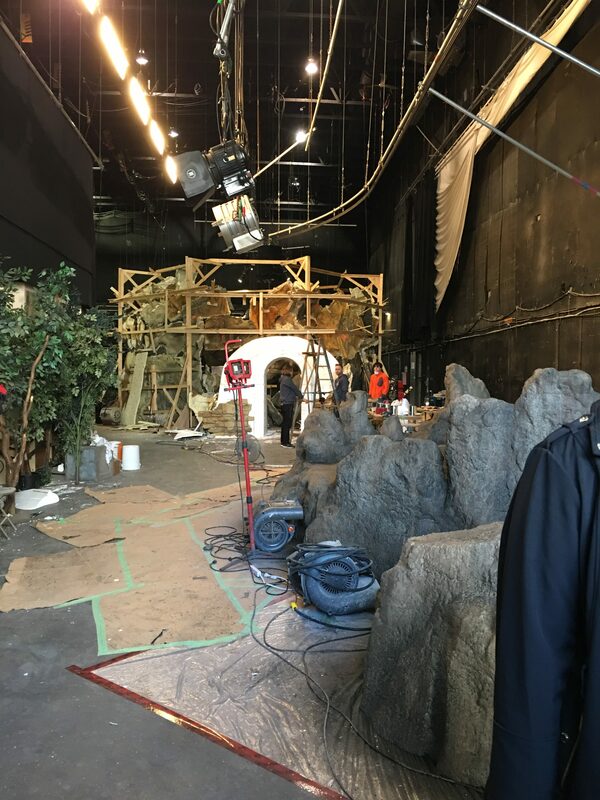 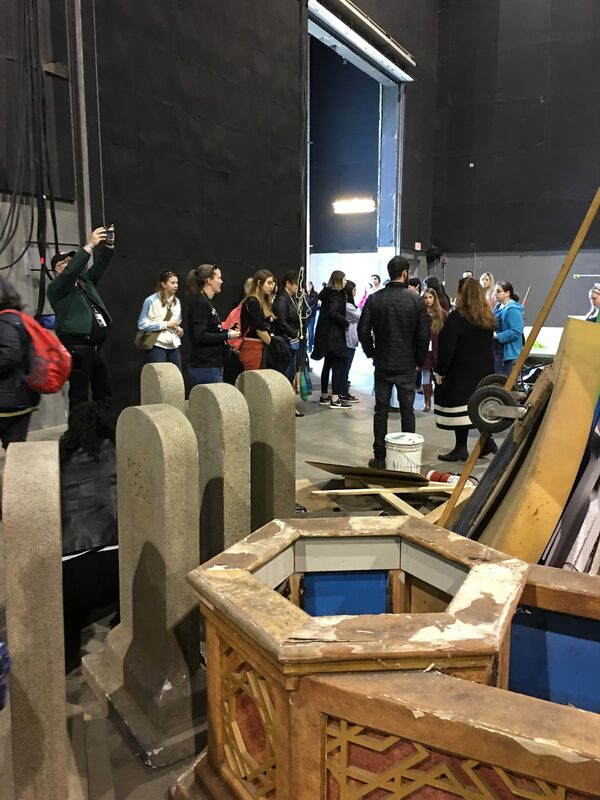 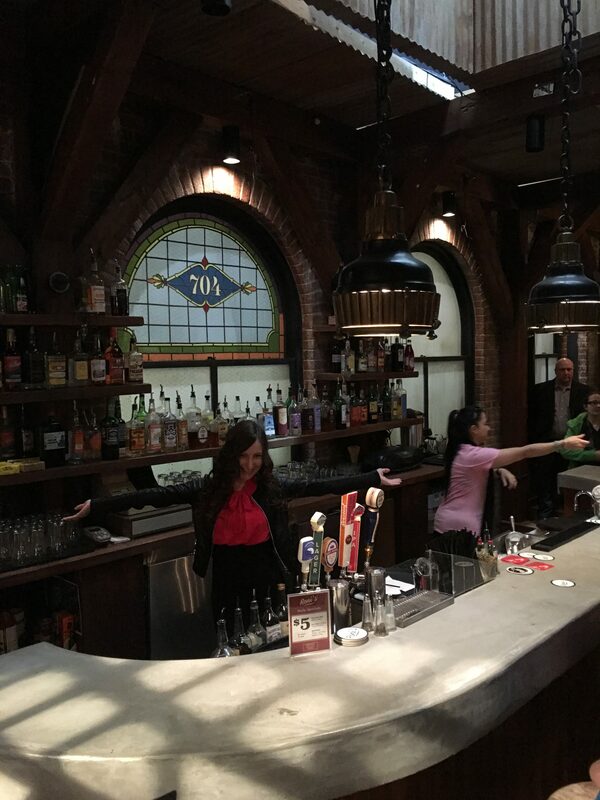 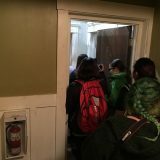 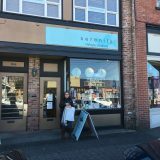 Our Gold Ticket included a guided tour of the sets where they filmed Once Upon A Time at the Bridge Studio where we saw behind the scenes sets and costumes and props. 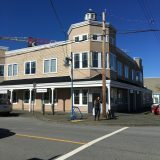 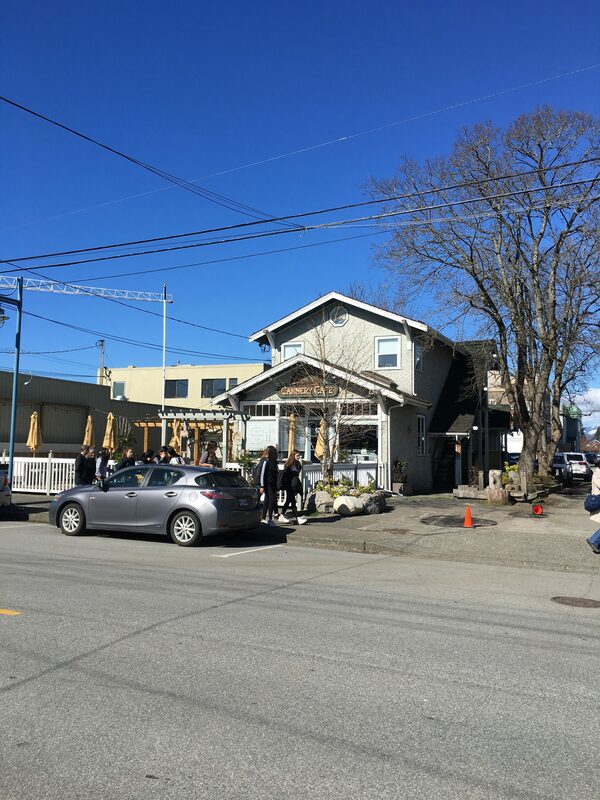 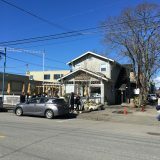 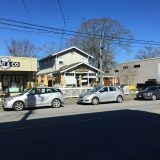 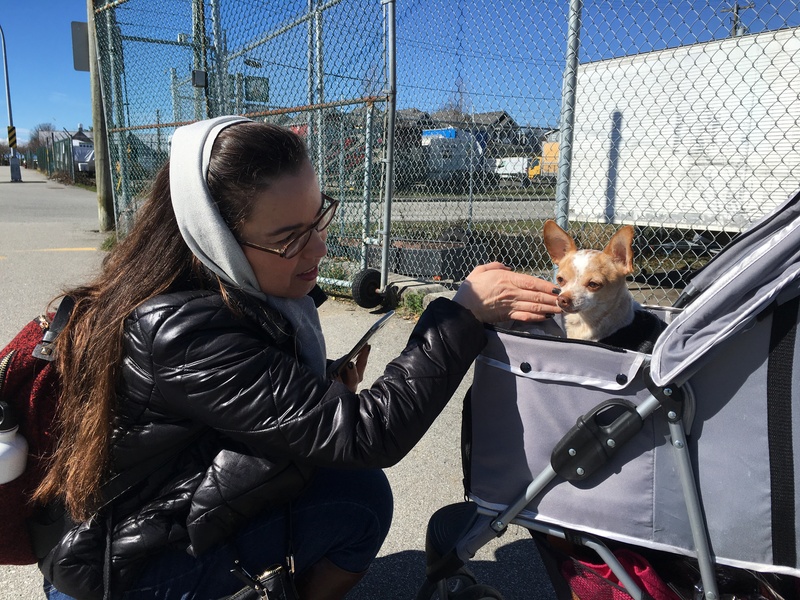 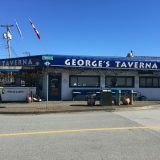 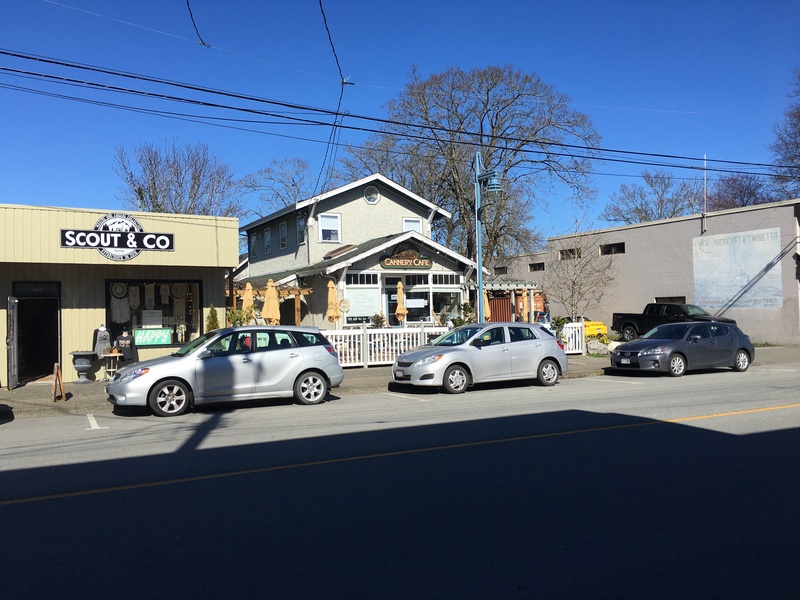 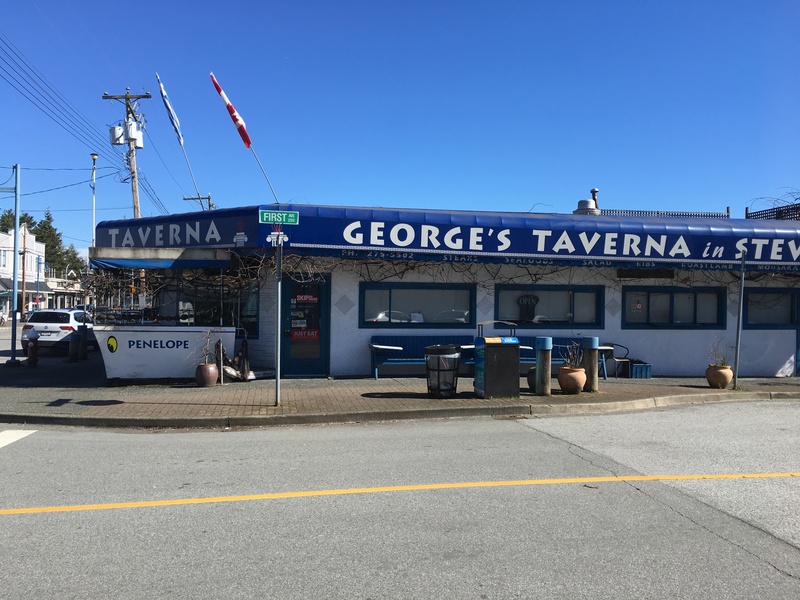 We also rented a car to visit Steveston where the location filming was done for the series. 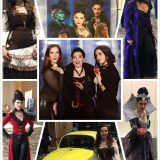 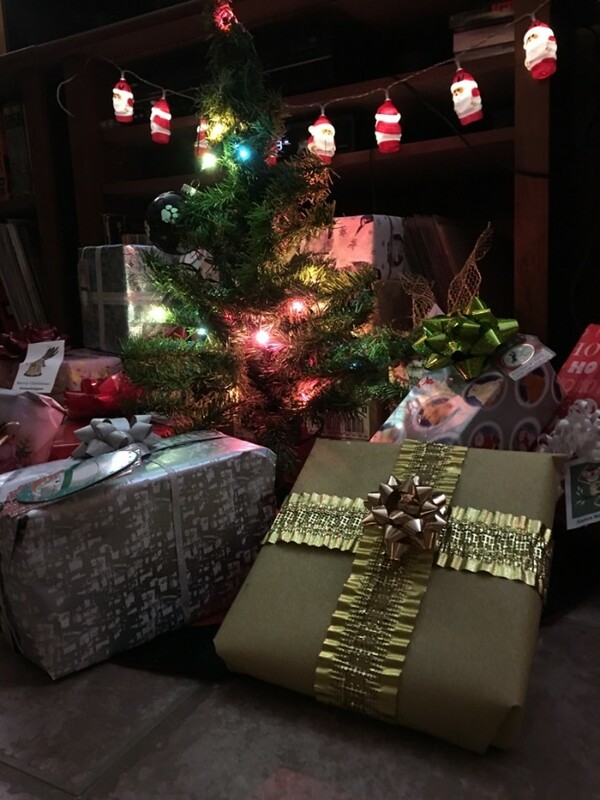 It was so awesome and everyone we met was simply magical! 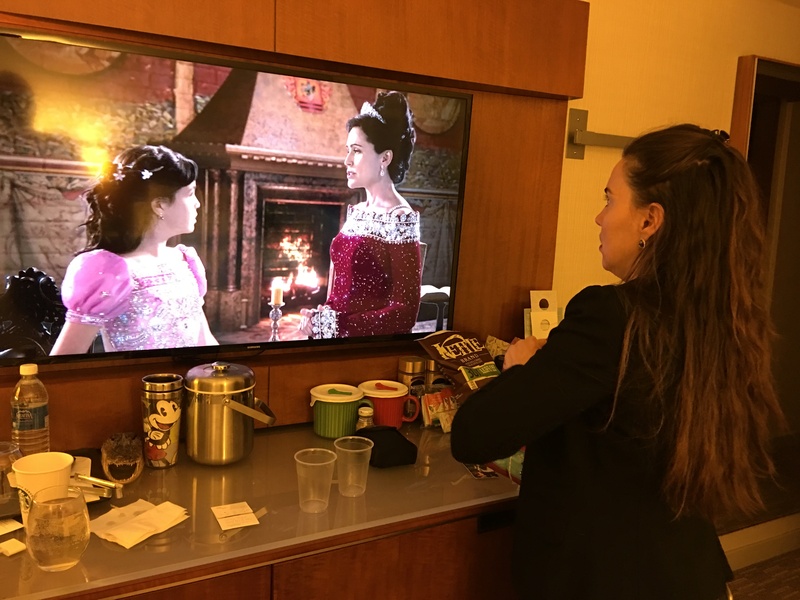 What an amazing time we had in our Westin Bayshore Suite watching an episode of OUAT while enjoying some room service! 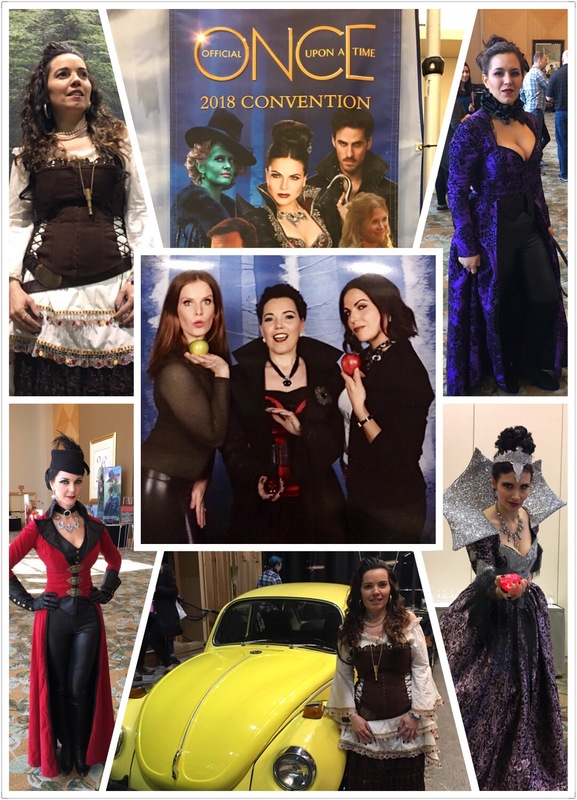 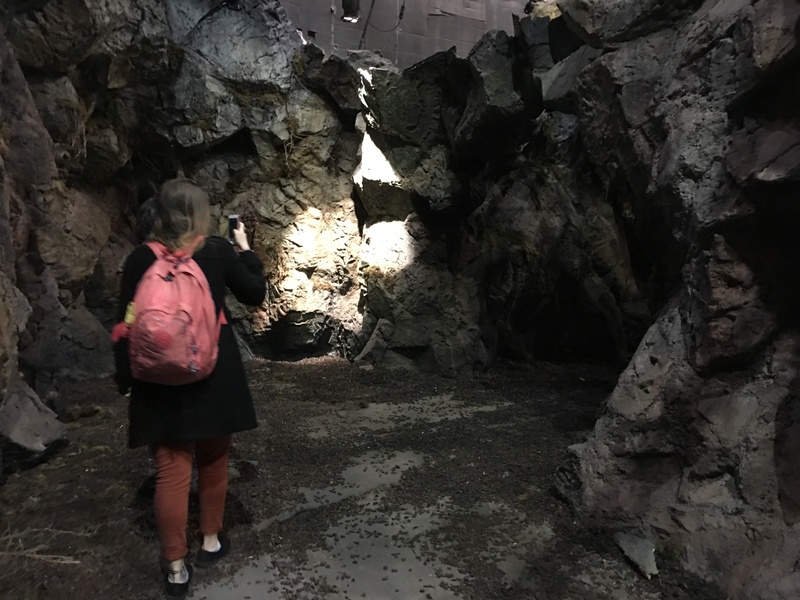 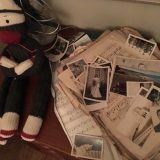 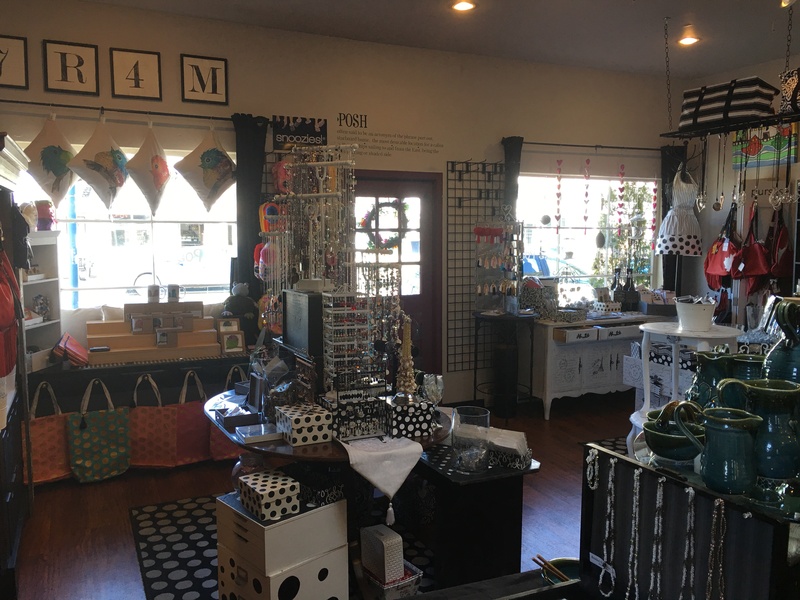 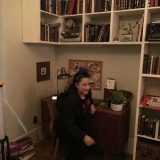 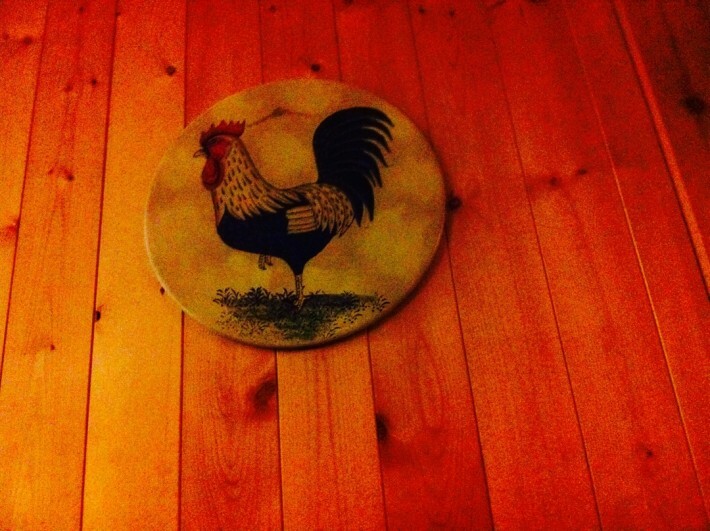 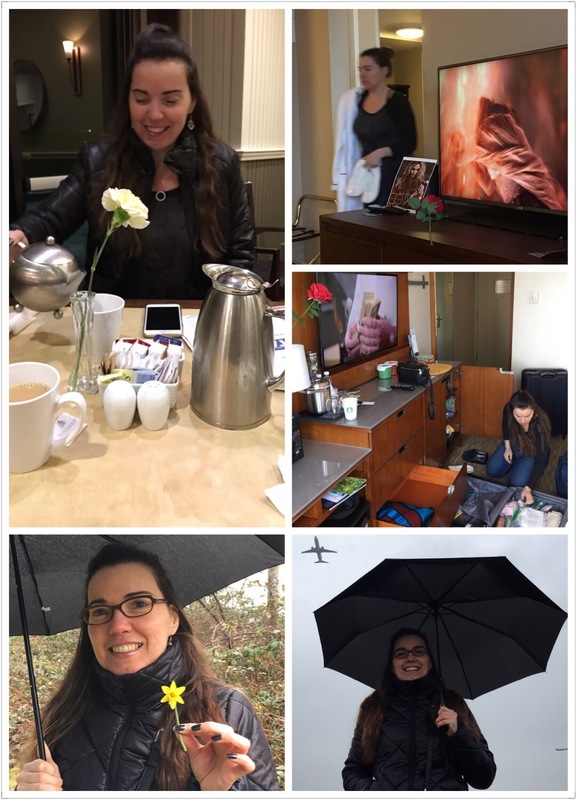 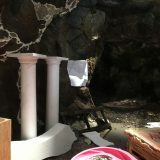 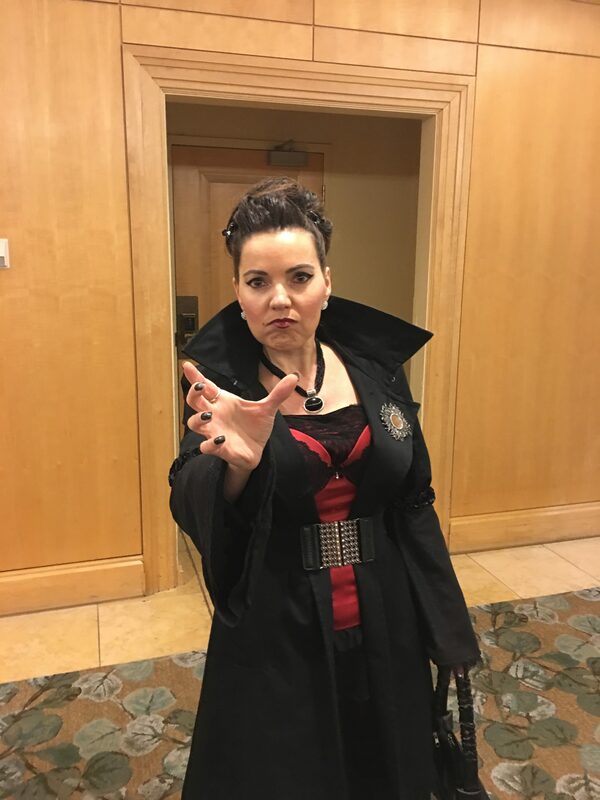 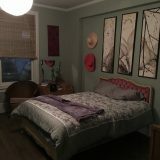 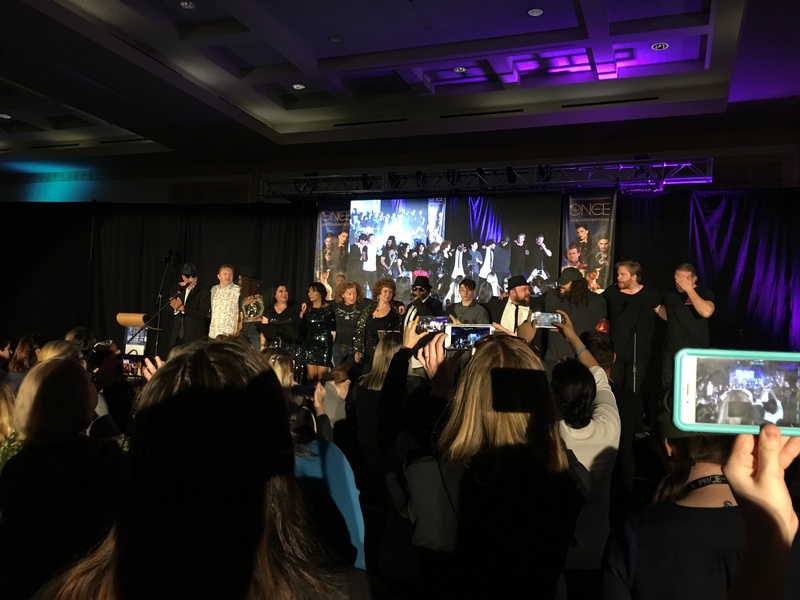 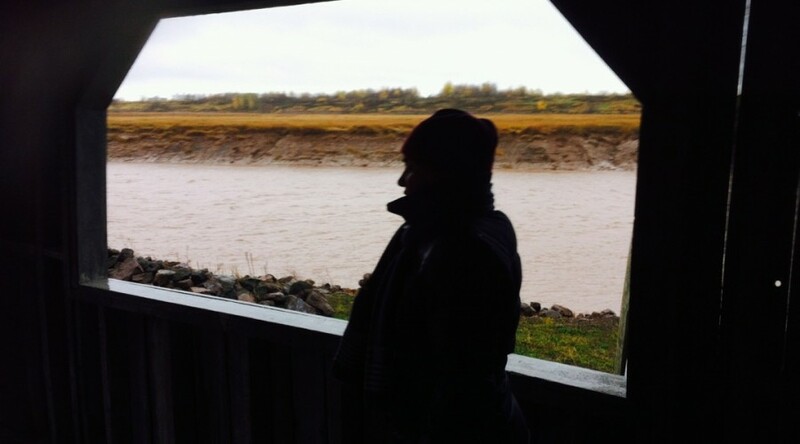 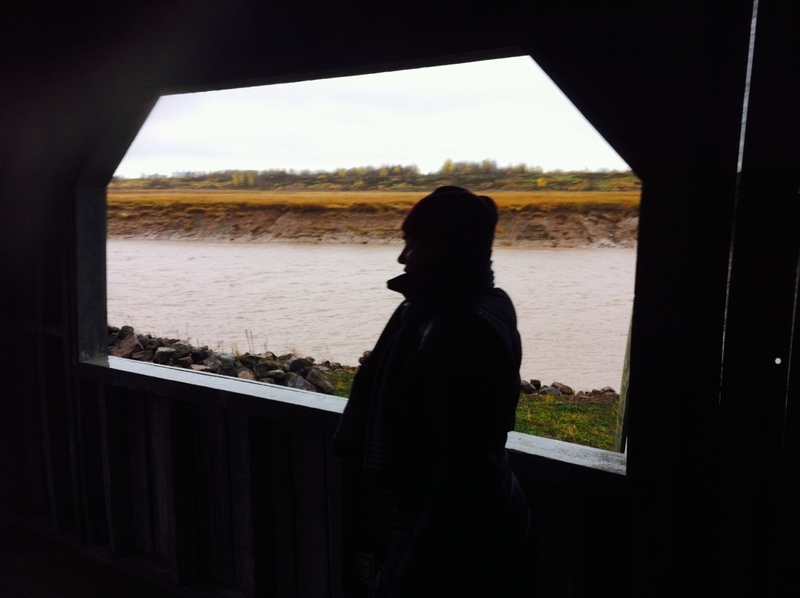 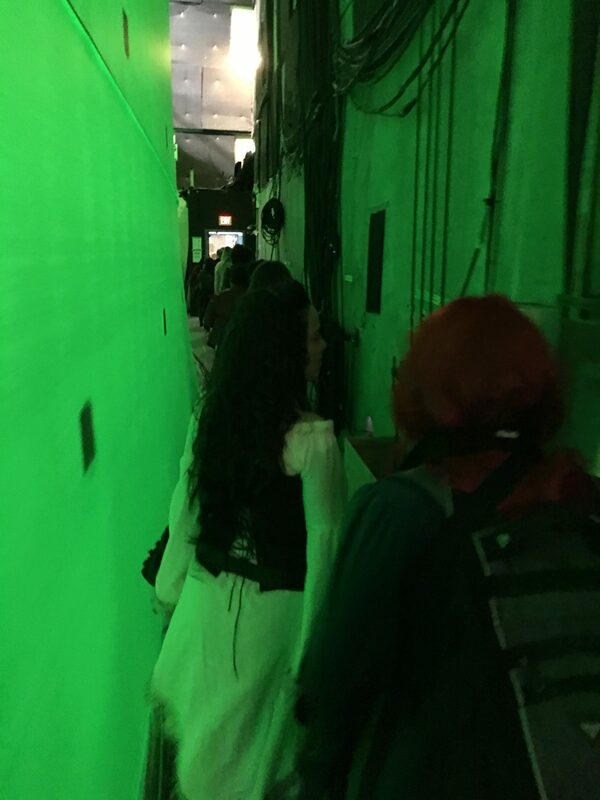 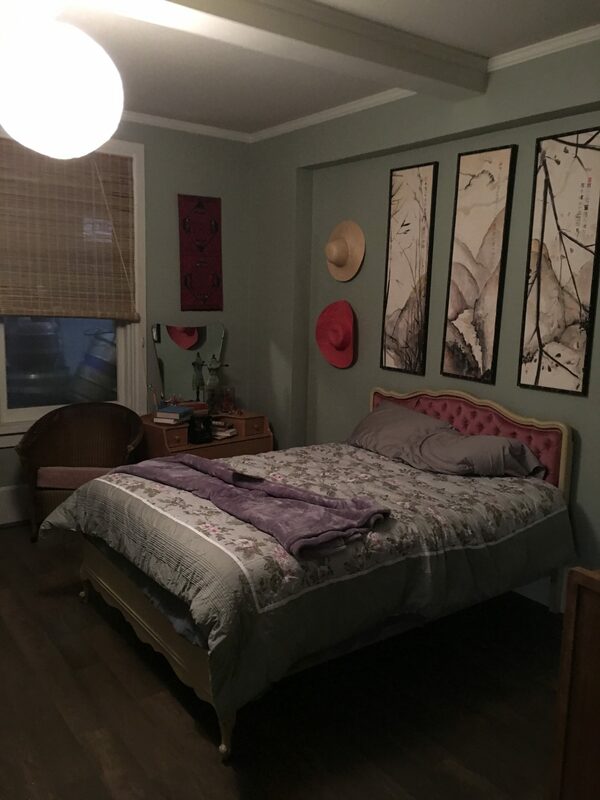 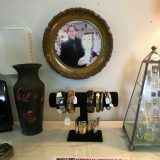 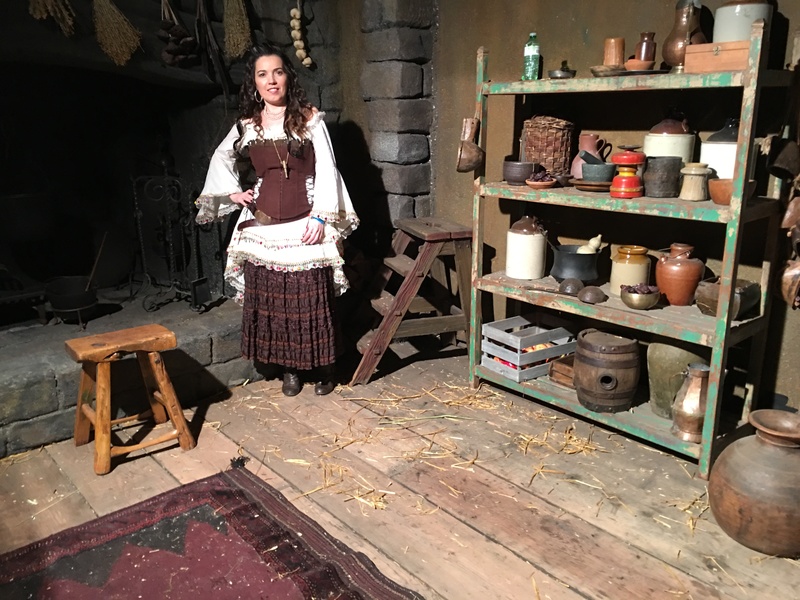 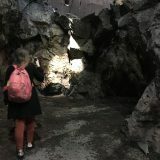 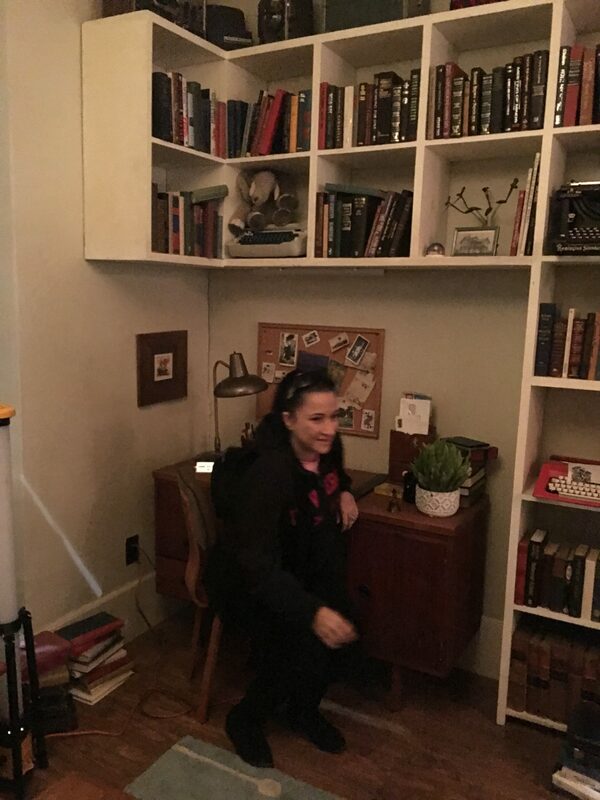 Such an amazing experience, but like all magic….it comes with a price!